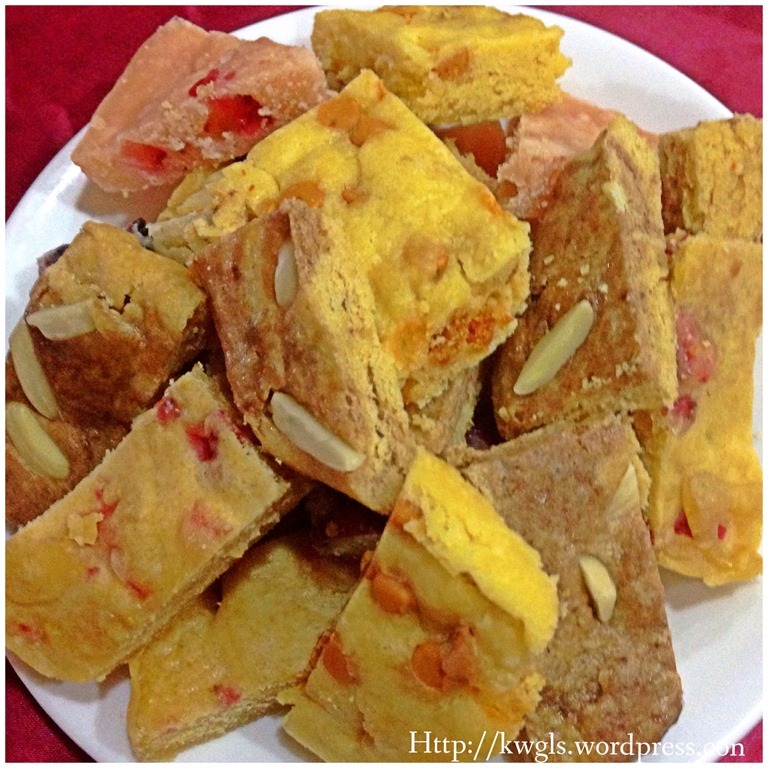 I have decided to prepare this cake this afternoon as I craved for this cake… I don’t usually prepare this cake because it is addictive, rather costly and time consuming. 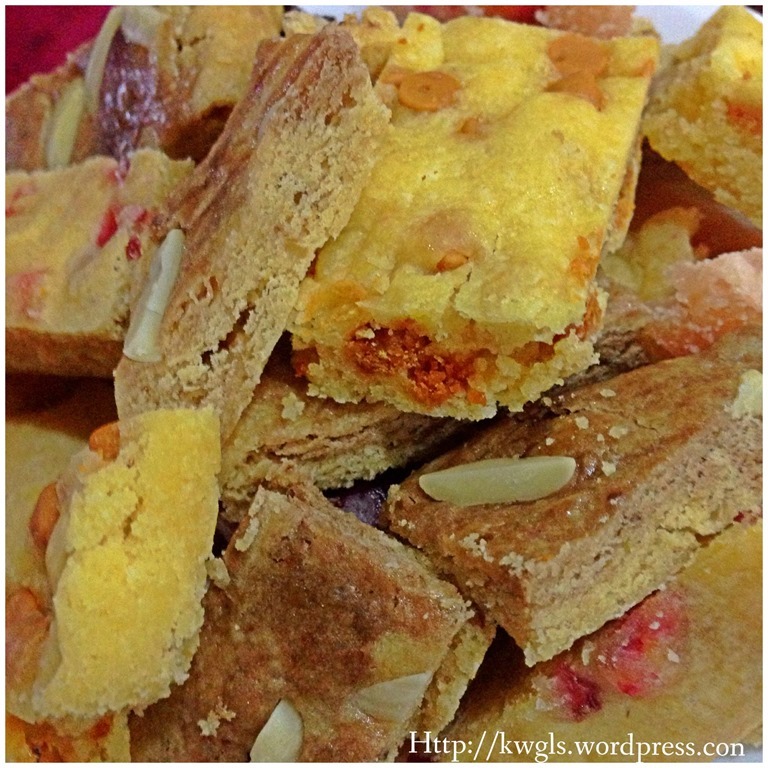 Even in Sarawak, this cake was only available during festivals such as Hari Raya Aidilfiltri.. 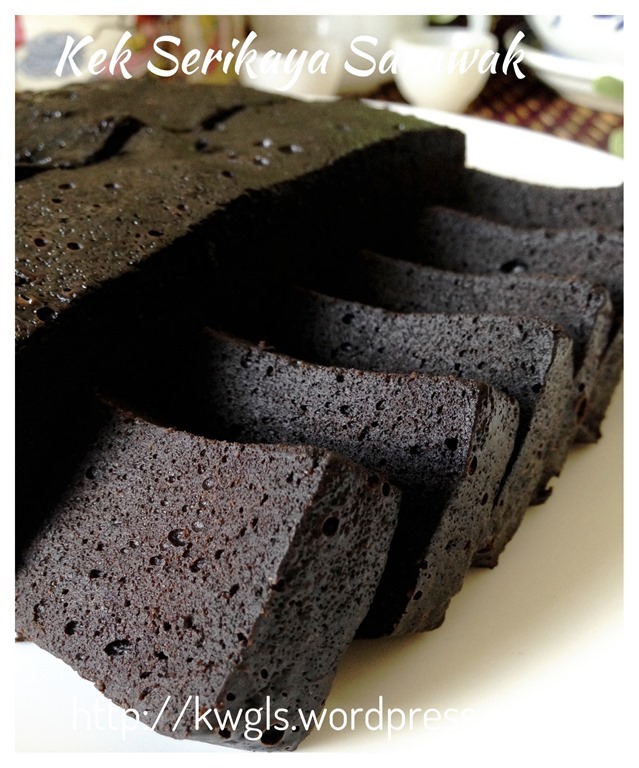 When I posted in the Facebook, most members of Facebook Group who have tasted the cake said that it is nice, rich and dense. For those that they purchased, it is also very expensive due to the cost of ingredients. 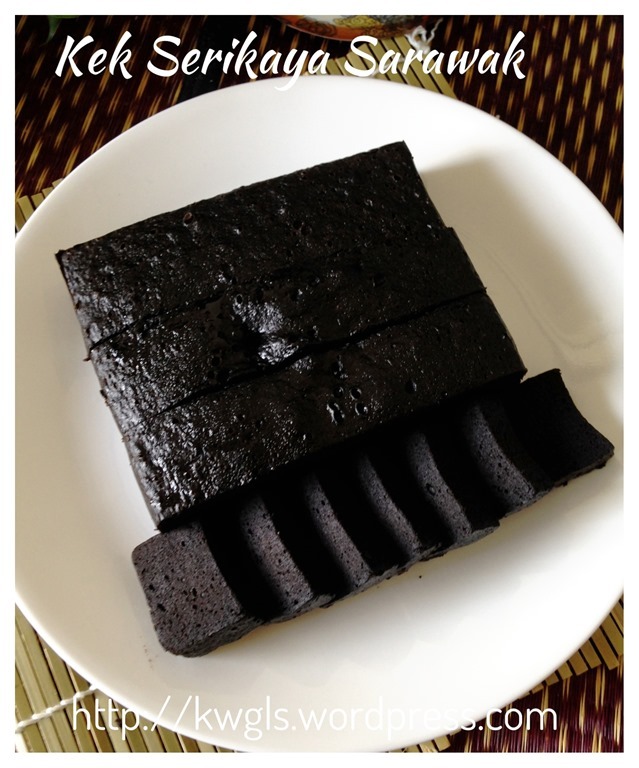 Further discussion also revealed that this cake is also called Kek Hati Parit and Kek Belachan because its darkness resemble the shrimp paste. Sarawak is one of the states in Malaysia located in the island of Borneo. 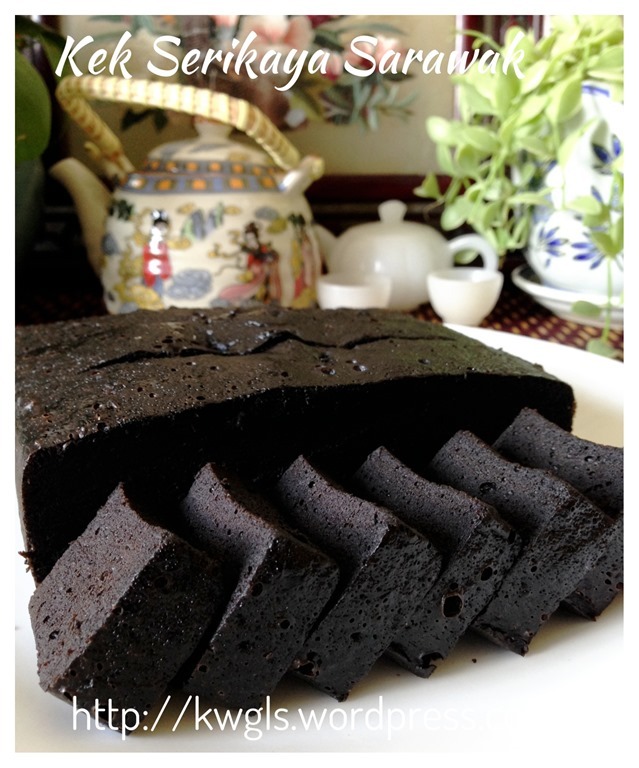 It has many unique cuisines and one of the rather unique pastries is the Sarawak Midnight Cake as mentioned in this post and another one more famous cake is the Sarawak layered cake or Kek Lapis Sarawak that looks below. 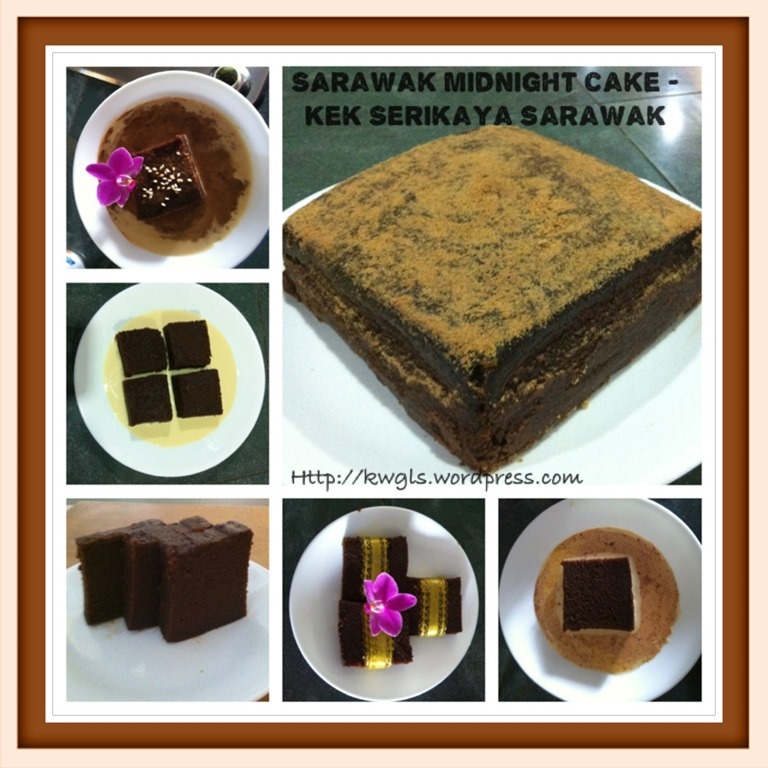 This post is concerned about Sarawak Midnight Cake or more well known locally as Seri kaya Sarawak Cake (hereinafter referred to as “Seri kaya Sarawak). 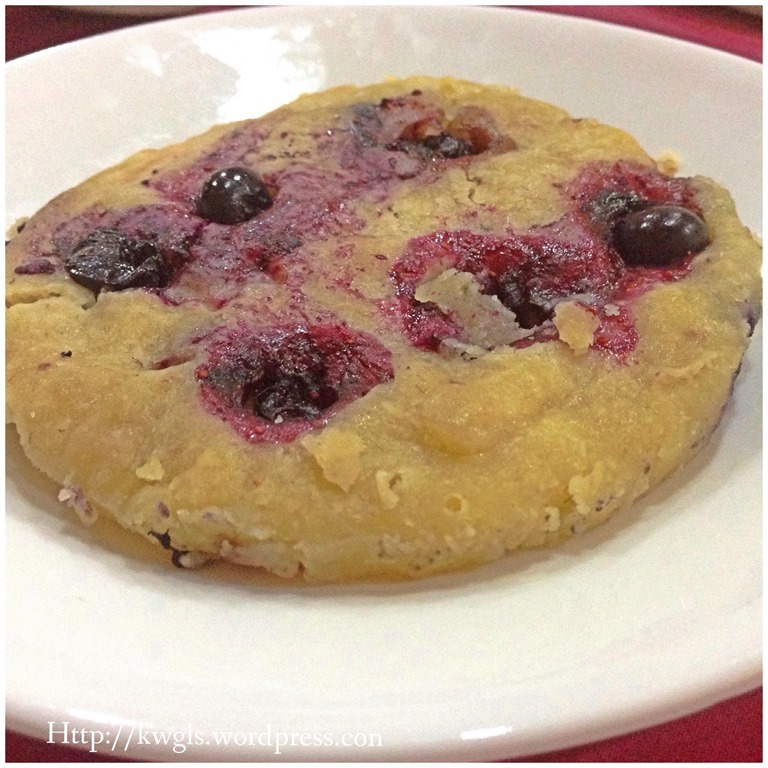 Note that kaya is also known as coconut jam made using coconut milk, eggs and sugars. 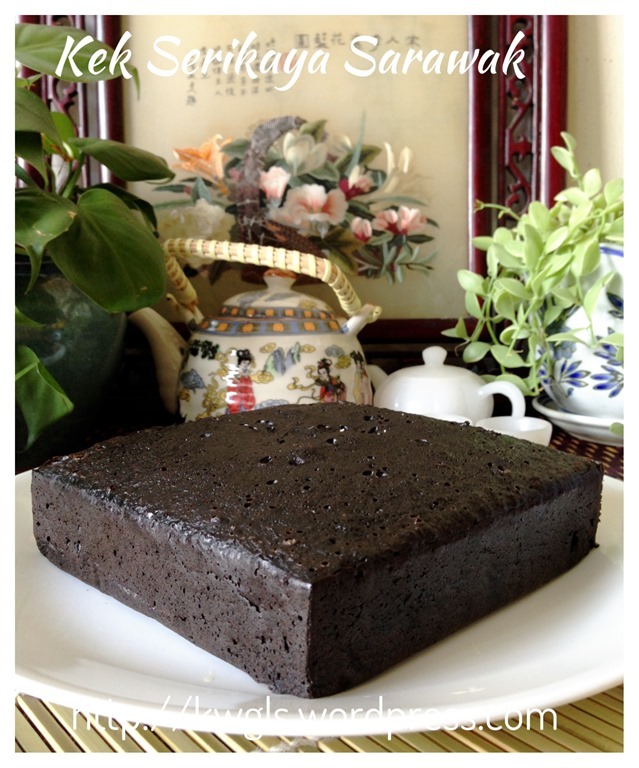 So from the name Seri kaya, Midnight Cake, Belachan Cake what can we say about the cake? 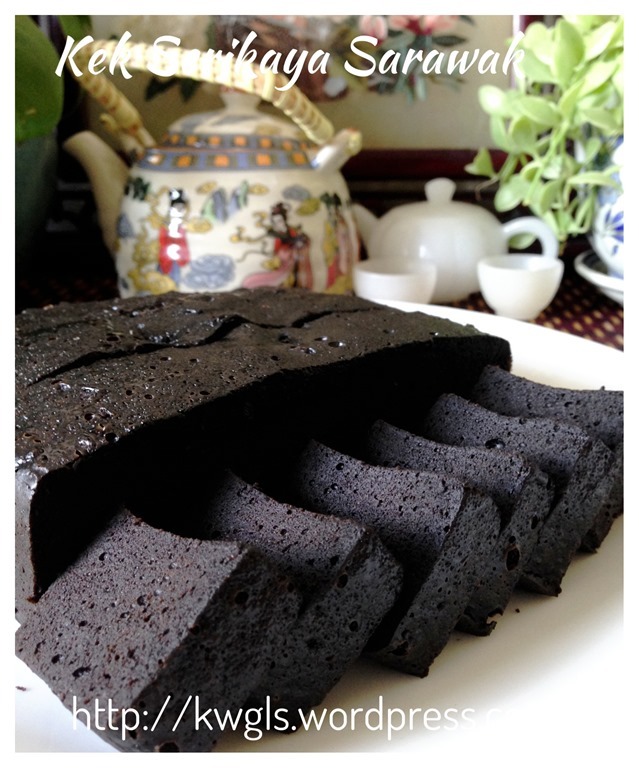 As can be inferred from its names, the cake has Kaya (coconut egg jam) with a belachan shape (and color) and it’s DARK in color. 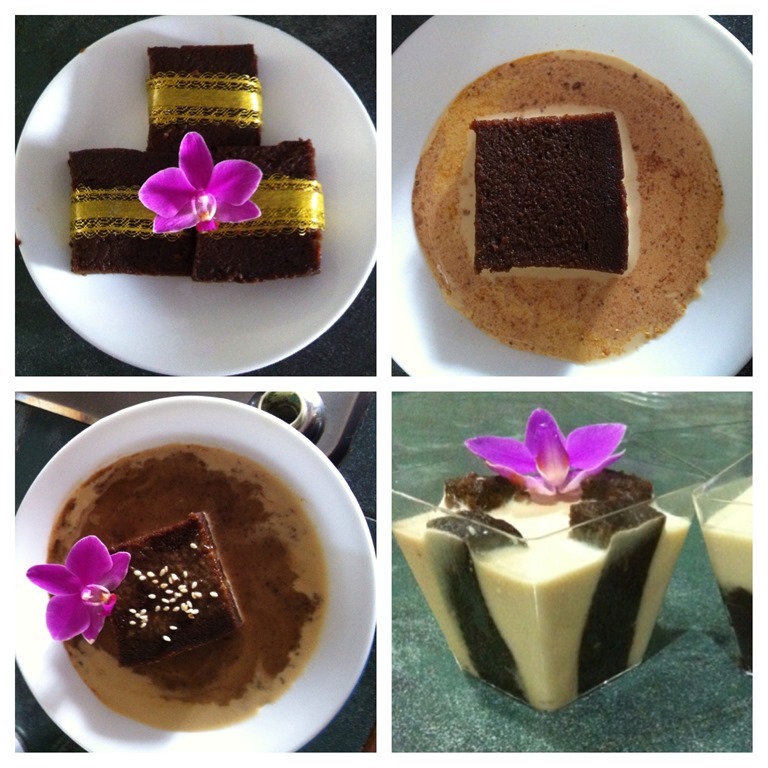 Recipes are calling to use various coloring agents to darken the cake be it artificial coloring, chocolate molasses, Sarawak black palm sugars, chocolate paste and even unconventional dark soya sauce. 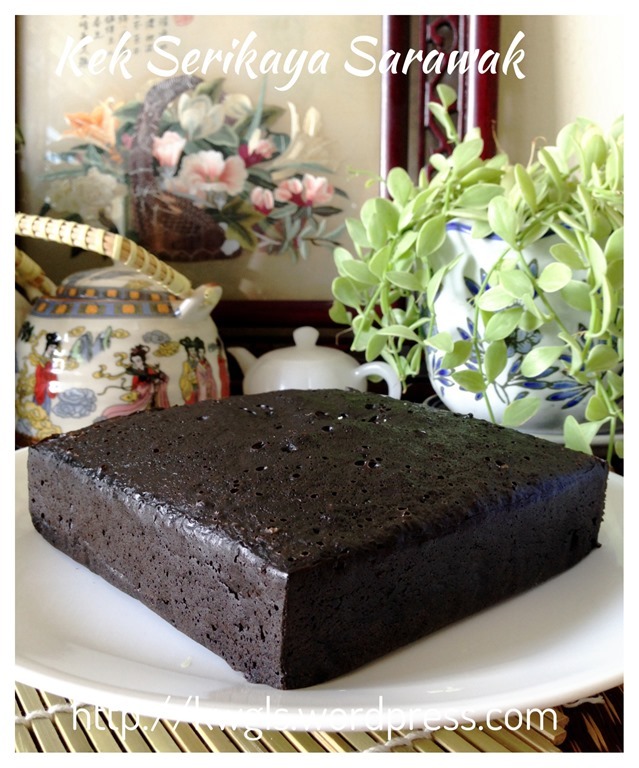 The uniqueness of this cake is that it is a moist, rich and dense steamed cake. 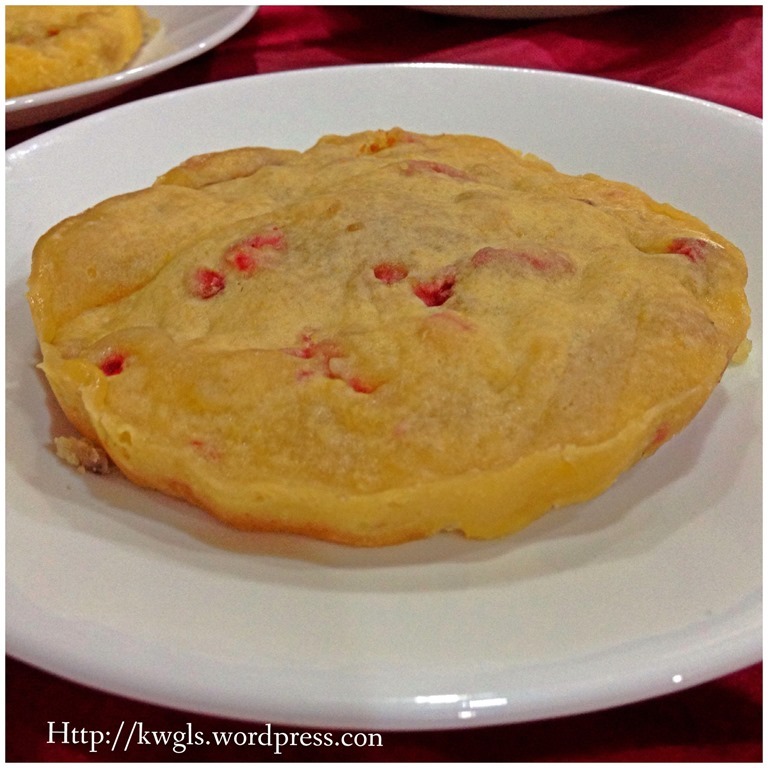 While I was writing some thing about Sarawak Cuisines in the Authentic Sarawak Food and History Page, Seri kaya Sarawak is one of the cakes that I have mentioned. After writing the post, I really felt the urge to make the cake since I have not tasted this cake for more than 15 years at least. 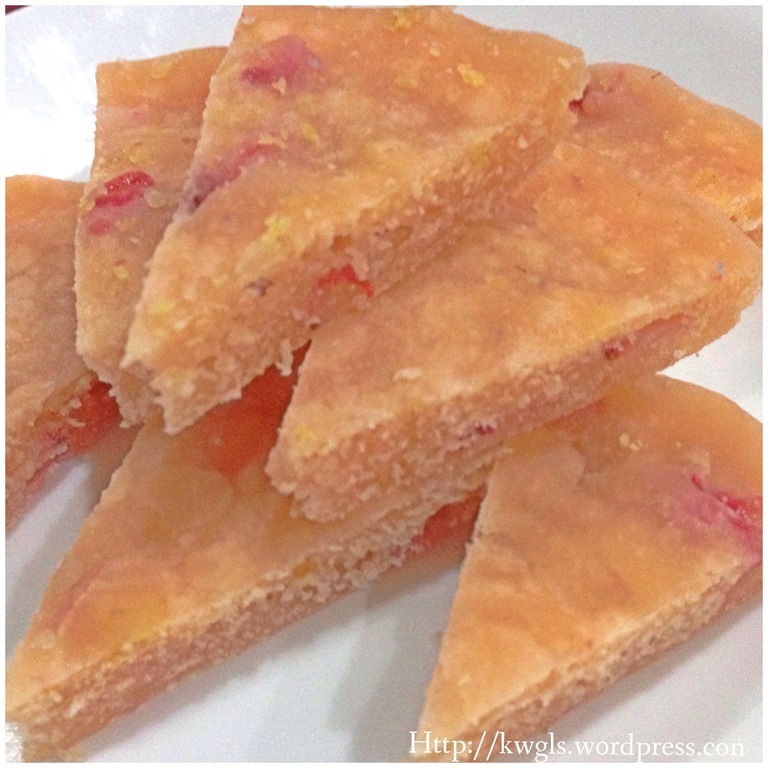 When I was in Kuching,Sarawak, during Chinese New Year, one relative used to give us this cake and during Hari Raya time (a Muslim festival whereby we do house visit), whenever I visited my Malay friends, I will always look out for this cake. I usually can’t stop eating the cake because it is just so yummy.. Looking at the picture of the cakes made me drooling and therefore I have decided to bake my own cake. 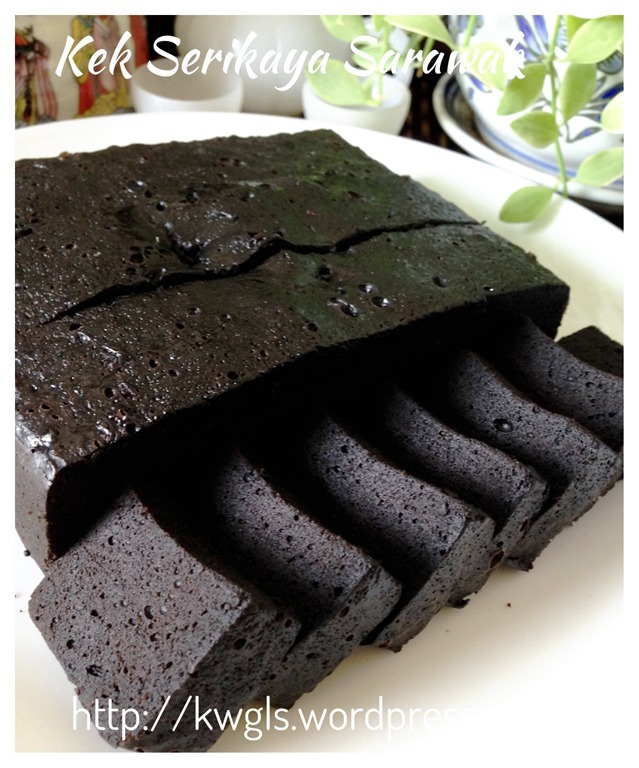 Food bloggers some time called this cake “secretive cake” and most of them do not willing to provide a recipe to the cake, They just bake the cake and show to the readers. Even if you can get hold of some recipes, the recipes that you have collected can be very different for each recipe. Be it the ratio, types of ingredients used, preparation method, everyone will claimed theirs were the best. For me, too many recipes is equivalent to no recipe. 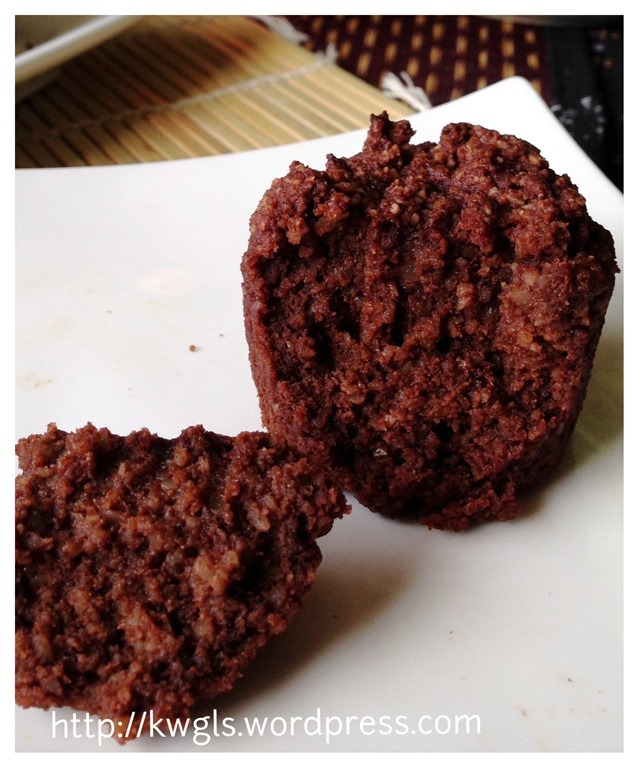 I have decided to create my own cake based on my memoirs on the texture of the cake and aroma of the cake. 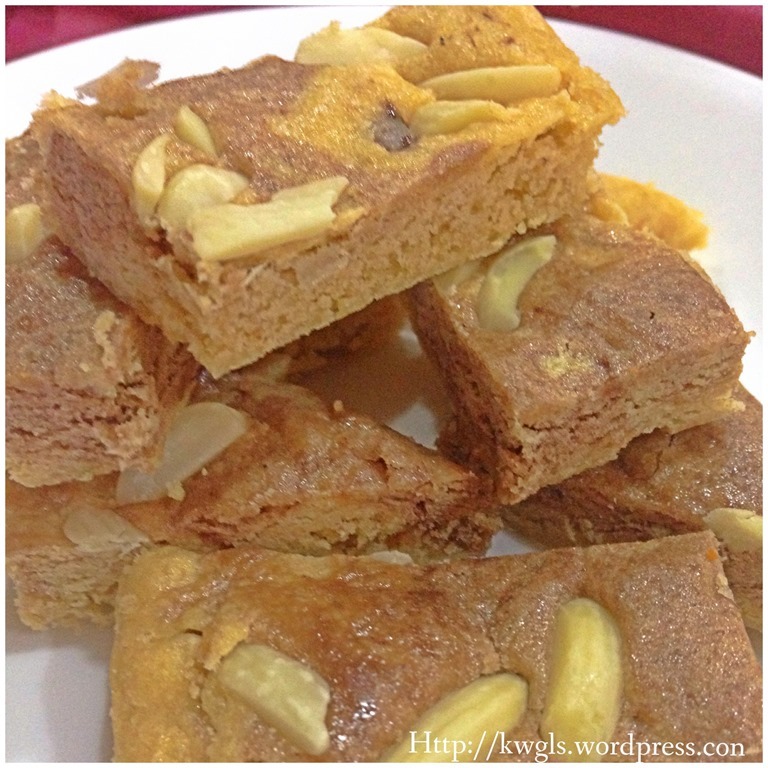 I have analyzed various recipes and come out with this recipe that I want to share with readers today. 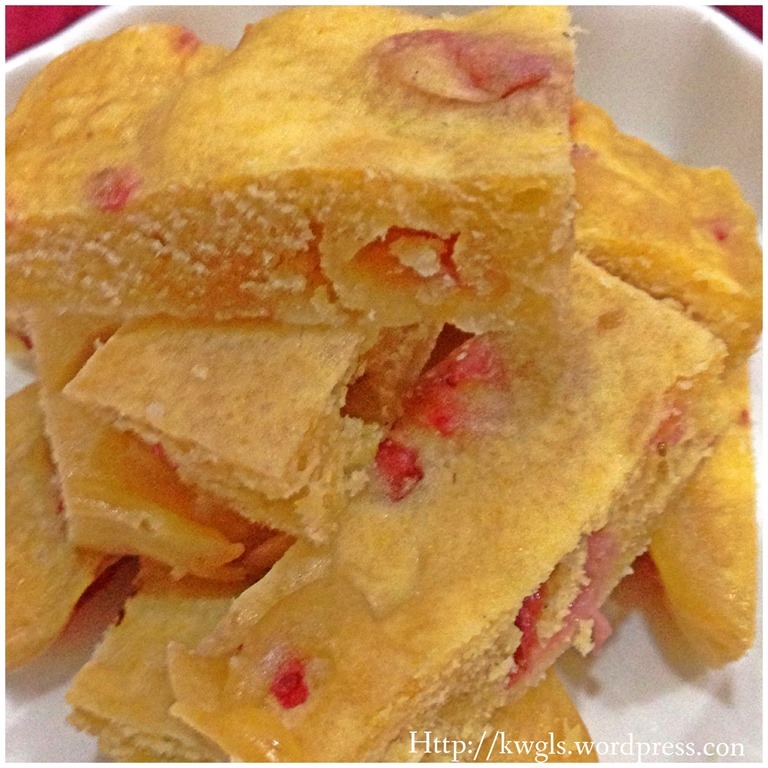 This is a rather simple recipe by passing a number of traditional methods of baking and skipped some unimportant ingredients usually used by other recipes. 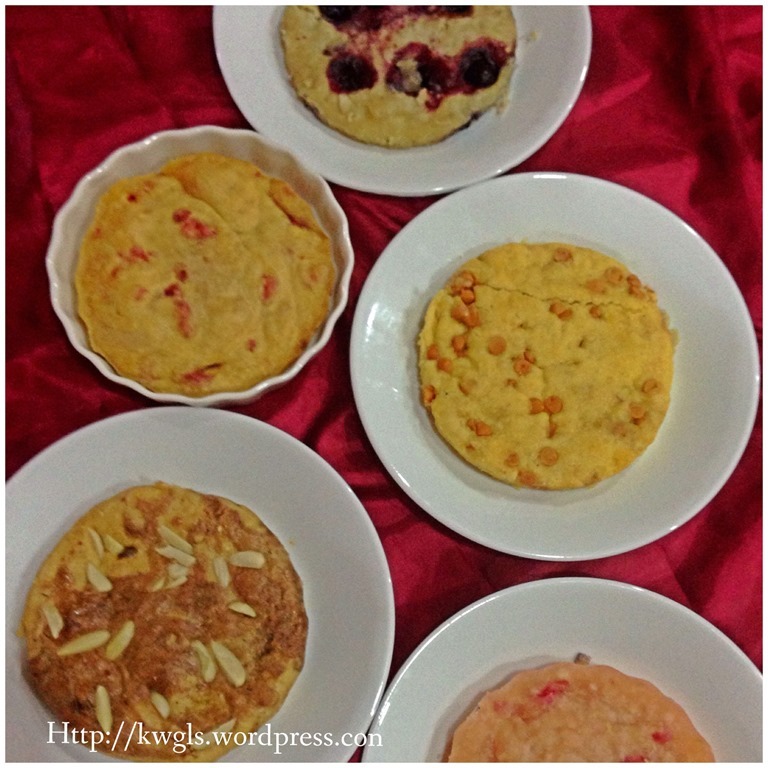 The output is at least 90%-95% similar to the cakes that I have tasted many years ago. (Note: this cake has a very distinct taste and it should be a moist, dense cake with fragrance of Horlicks (chocolate malt) and Milo). 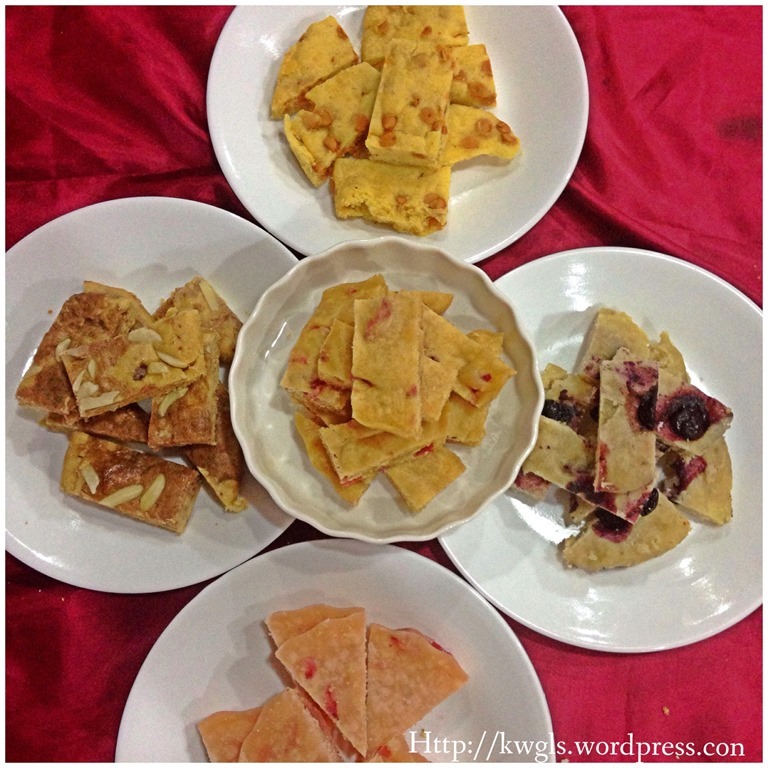 Most of the ingredients that was used are the breakfast beverages items. 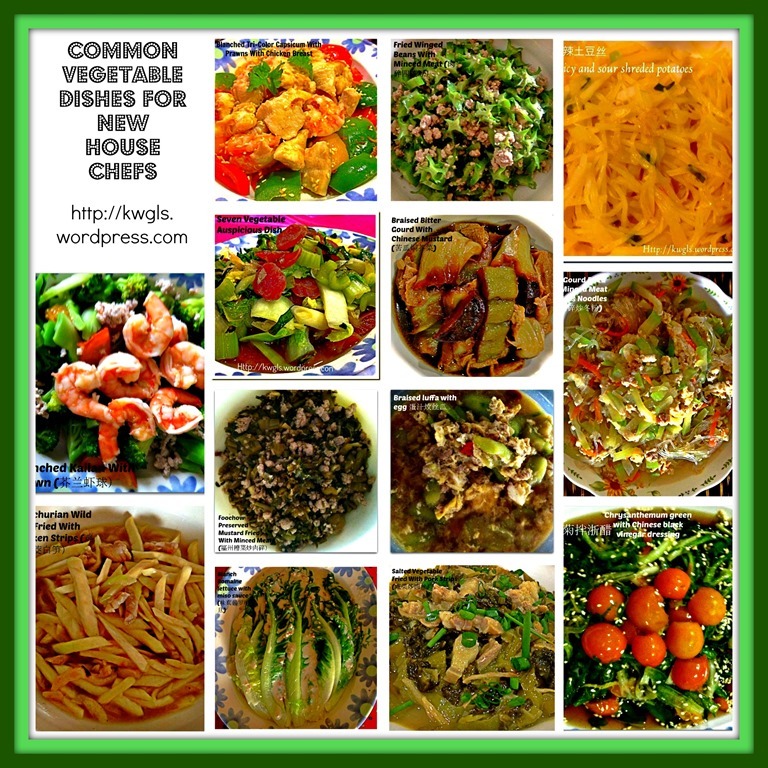 Do you see any trend in the measurements of the above recipe? 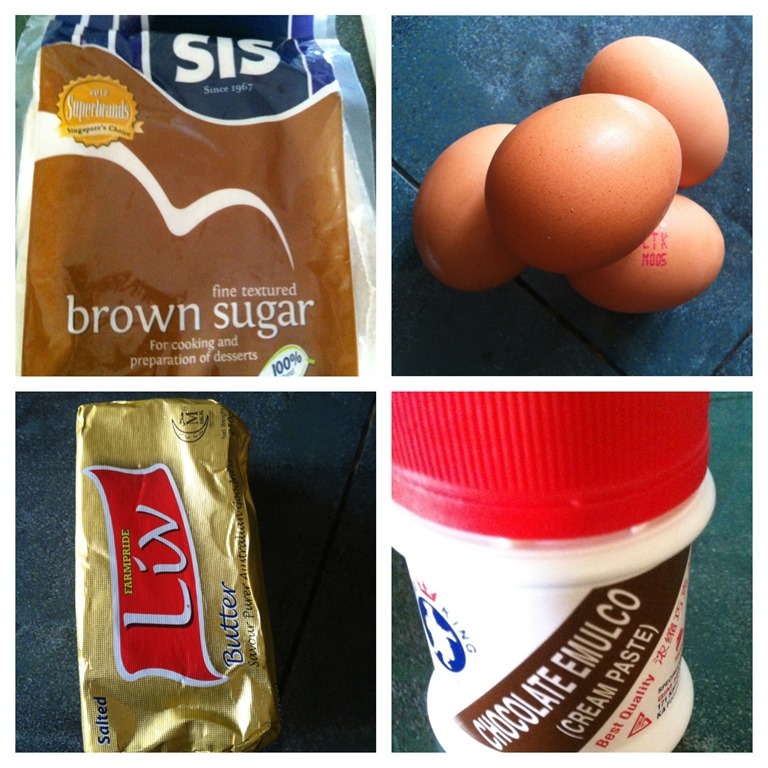 The recipe can be summarized again in the following ratio. These steps of preparation are rather unconventional. 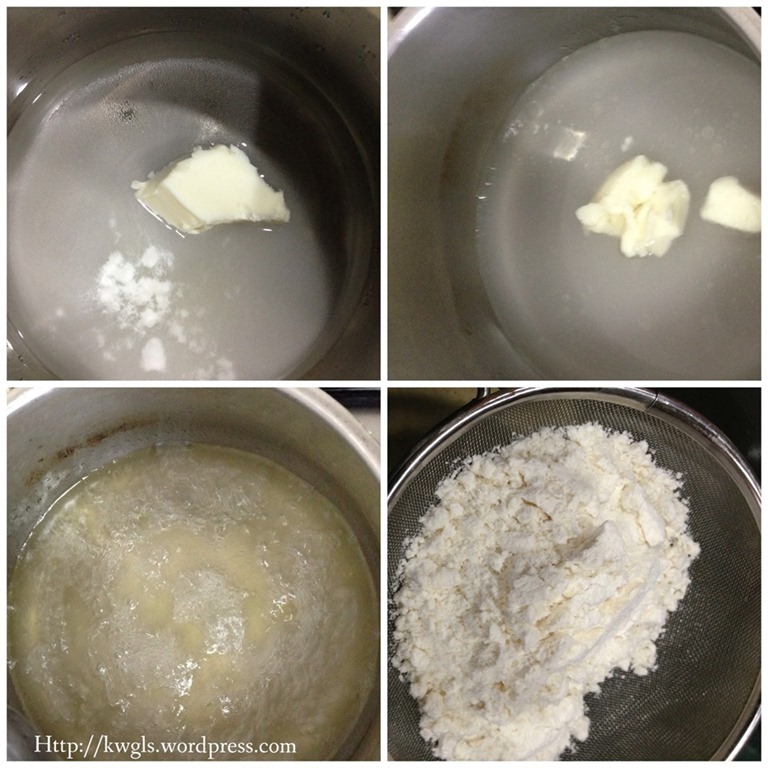 Conventional method will advise the use of creaming method (meaning beating of sugar and butter). The creaming step is mainly used if you want a fluffier and lighter cake. However, as this cake is supposed to be moist and DENSE, therefore, I do not use the creaming method. I have used the mixer purely for mixing purposes. 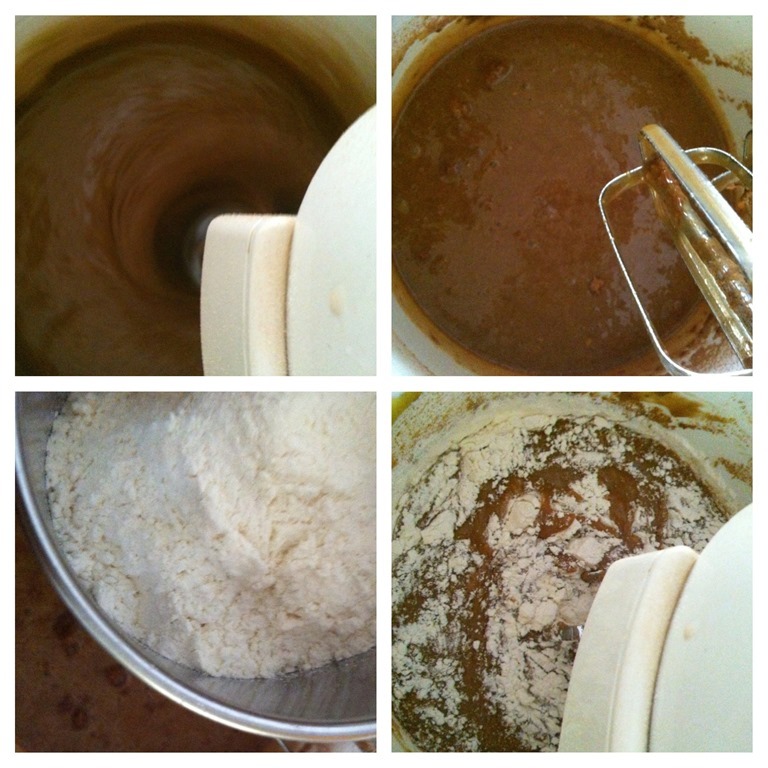 In all the steps, just ensure that the mixer is at low speed and as long as the ingredients are well mixed, just put another ingredient in. Well mixed basically means that the color are consistent. 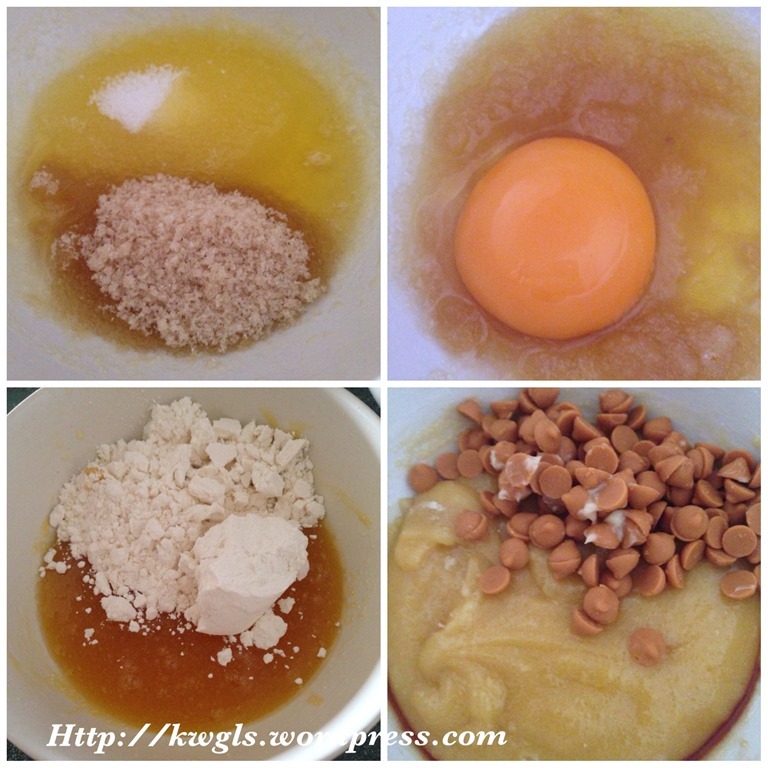 This mixing method will saves you a lot of time as compared to the creaming method. If you do not have a mixer, you can mix it manually and it shouldn’t be very difficult as most ingredients are liquid and has lot of moisture content. In a mixing bowl, put the brown sugar, condensed milk and melted butter together. 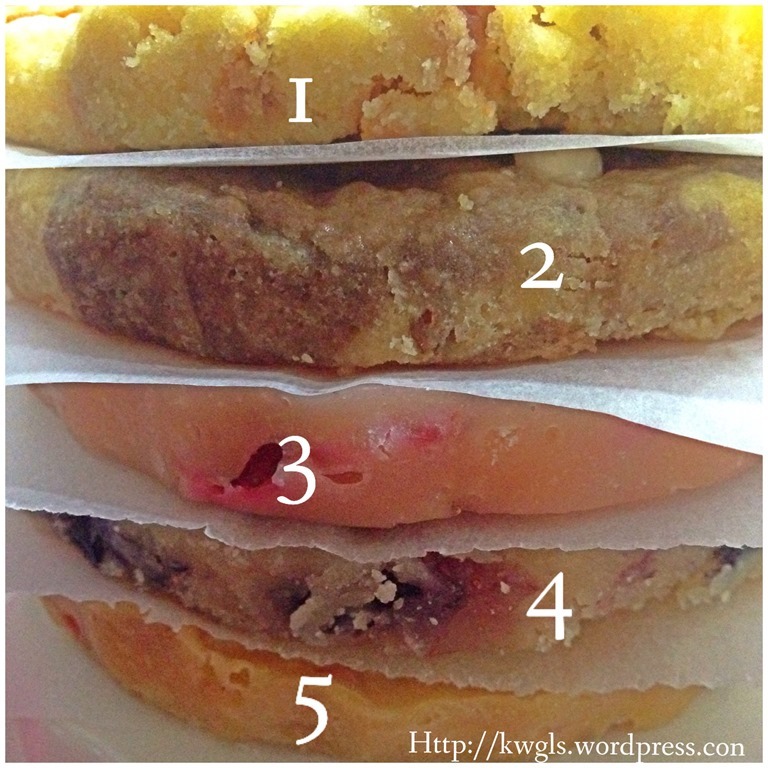 Beat at low to medium speed; It will take the most 1-2 minutes and look like the batter in pic 3. 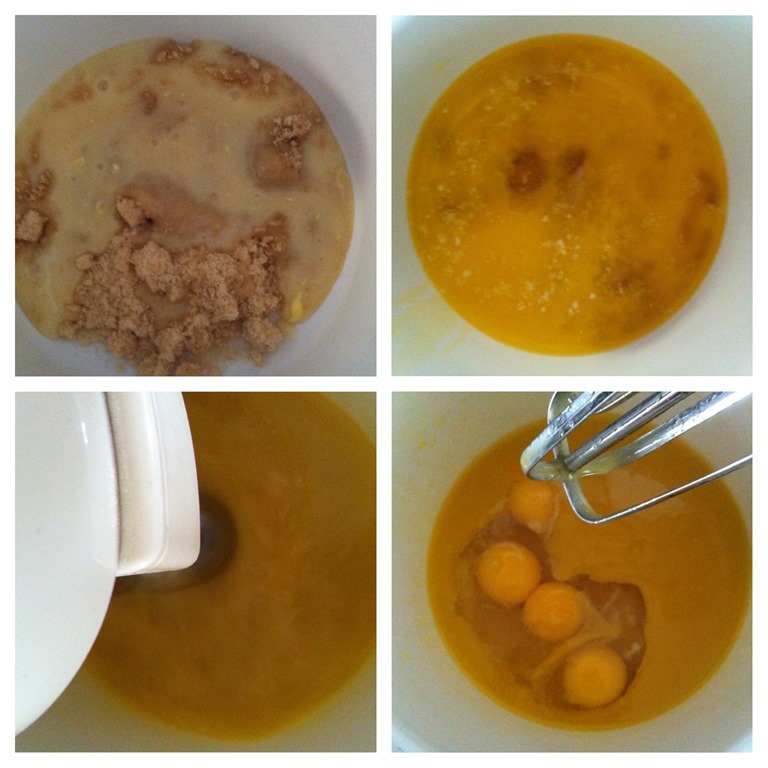 Add in the cracked eggs and continue beating at the same speed until well mixed. Add in the coconut jam (kaya) and continue to beat at same speed for 1 minutes. 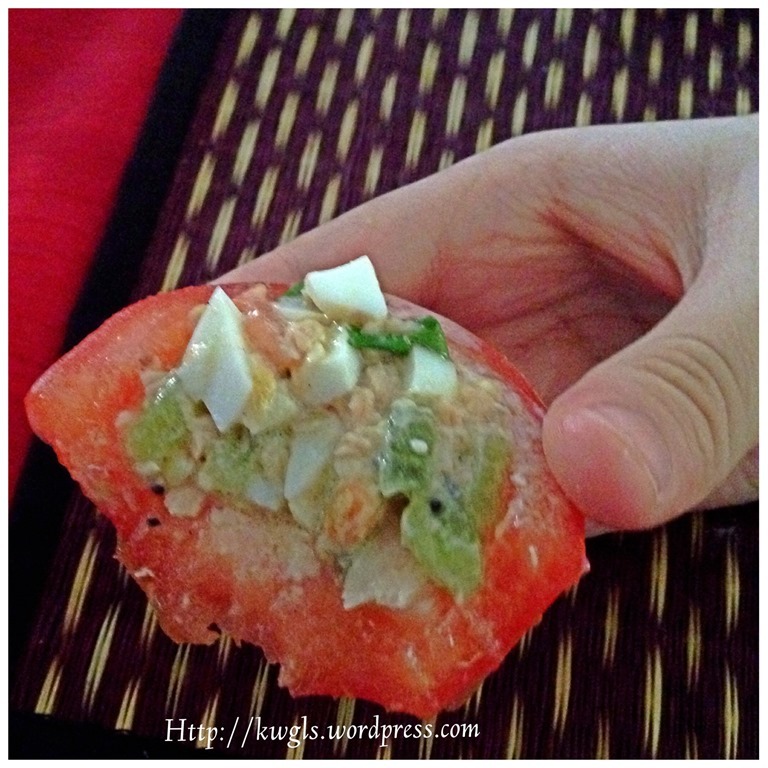 Note that I have used the Nonya Kaya which is greenish in color. 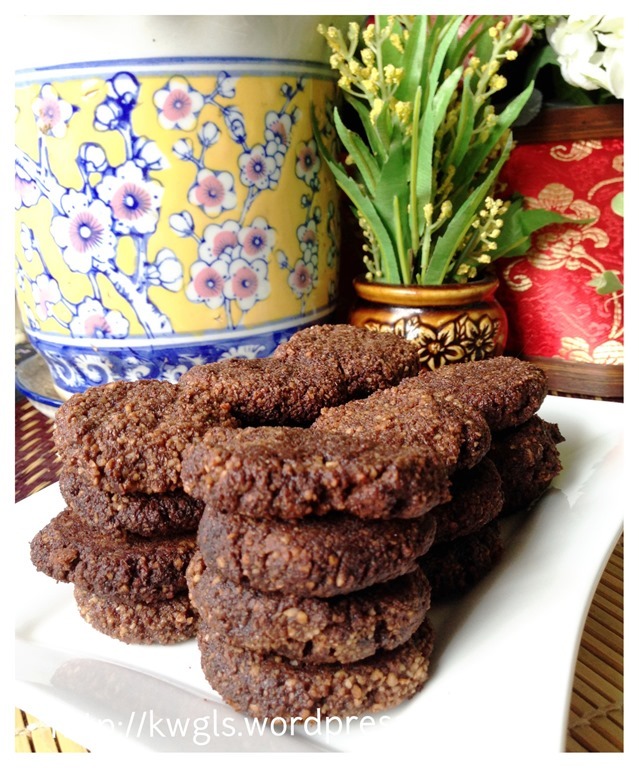 However, you can also use other types of kaya such as gula melaka kaya (dark brownish) or Hainanese kaya (orange to light brownish). Add in the Milo and Ovaltine (chocolate malt and can use Horlicks as well) and continue to beat for another 1 minutes or until color consistency is reached. 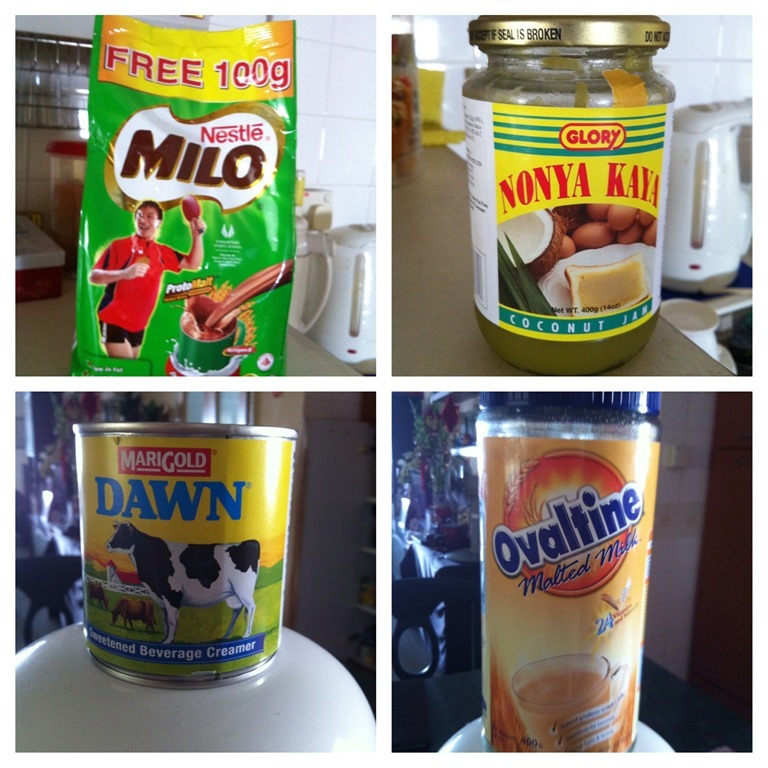 After adding Ovaltine and Milo, you will note that the color start to turn brownish. As Ovaltine and Milo will coagulate and takes a while to dissolve, you just have to ensure that there are no more lumps in the mixture. 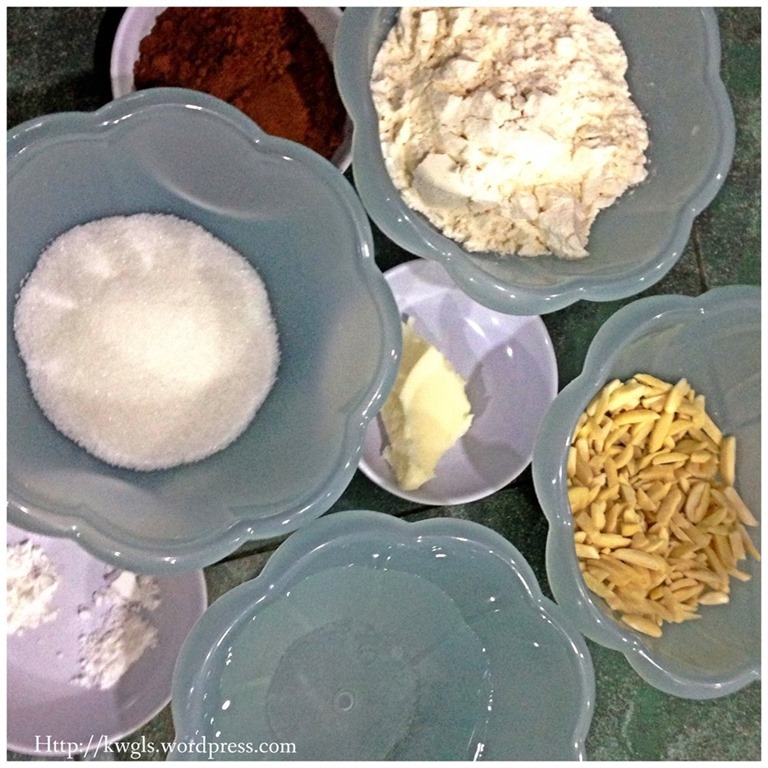 Sieve the plain flour into the mixture and continue to mix until color consistency is reached. 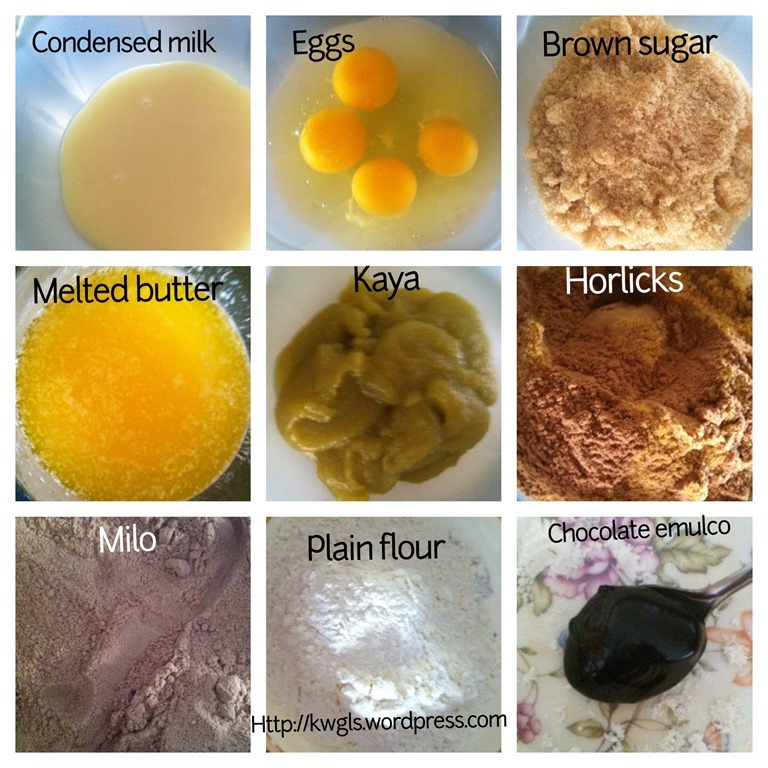 Plain flour shall be used and not the cake flour or self raising flour and no baking powder or baking soda is needed. THIS IS A DENSE CAKE and therefore, you do not want your cakes to be too fluffy. After it is ready, add in 2 table spoons of chocolate emulco (alternative chocolate paste, black palm sugar, brown color agent) and beat until the there is no more lumps and color is consistent. It takes another 1-2 minutes. 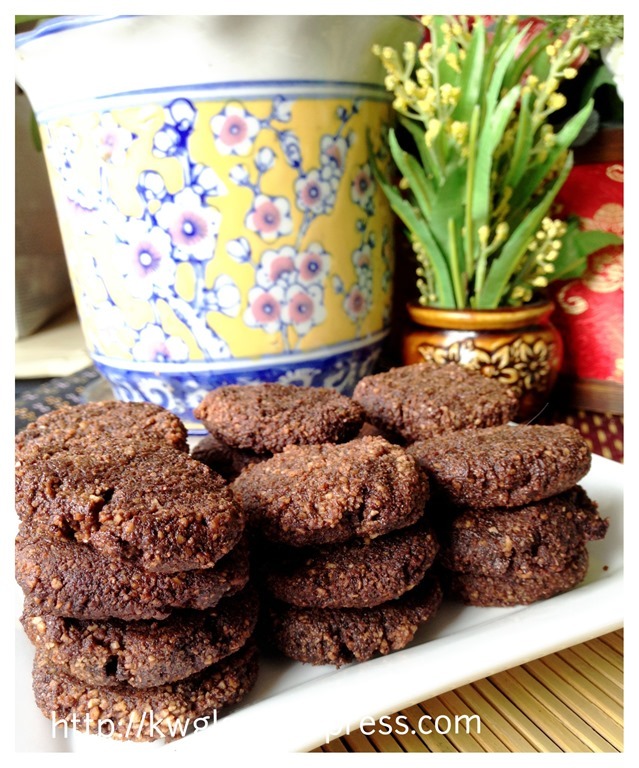 If you use black palm sugar, there is no need to use brown sugar. Volume will be 150g black palm sugar. Get ready a 6 inch square tin, grease the sides and bottom, dust with wheat flour. Greasing can be done with any fats such as cooking oil etc. I have used the wrapper for the butter to grease the sides. Alternatively, you can just use the left over melted butter in your bowl to grease the side. This is something not usually presented in the recipe books but I have purposely put it here to share with readers since it is a good practice to “conserve” world resources, joking. Get ready a steamer and bring the water to boil. 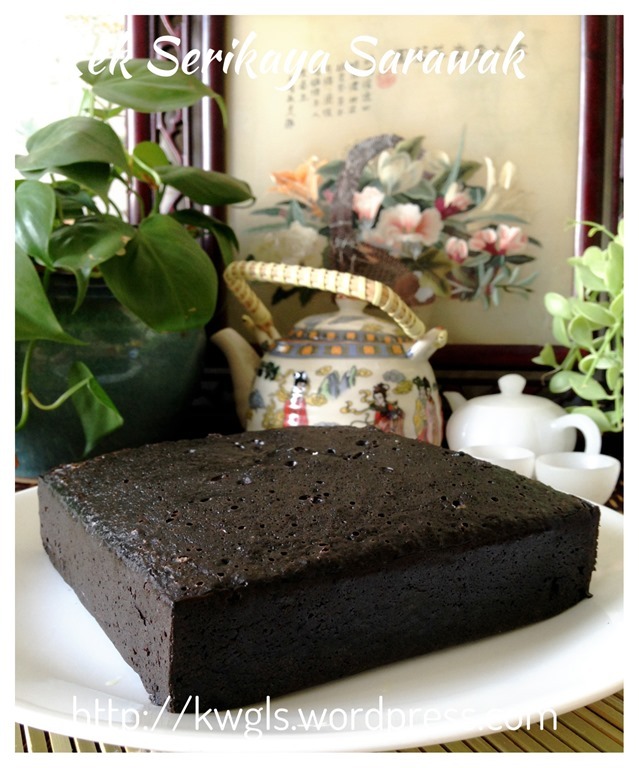 As this cake is very dense, therefore, it need a few hours of steaming. That steaming process can be rather long reaching 2-3 hours and if it an 8 inch tin, may need 4-5 hours. 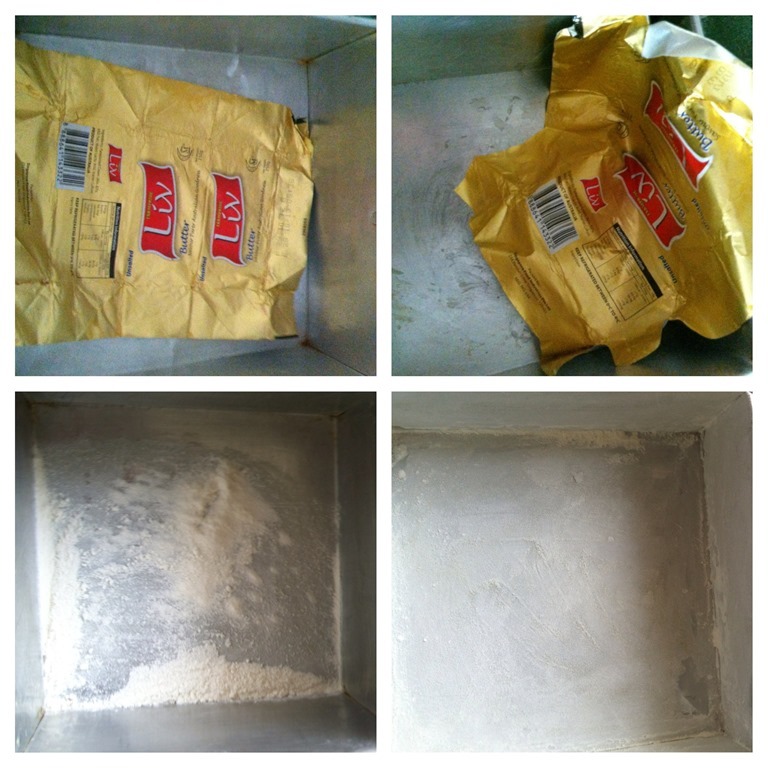 Pour your batter into the baking tin and cover with aluminum foil. This is to avoid the condensation of water vapors dripping into the cake batter making it hard to get cooked. 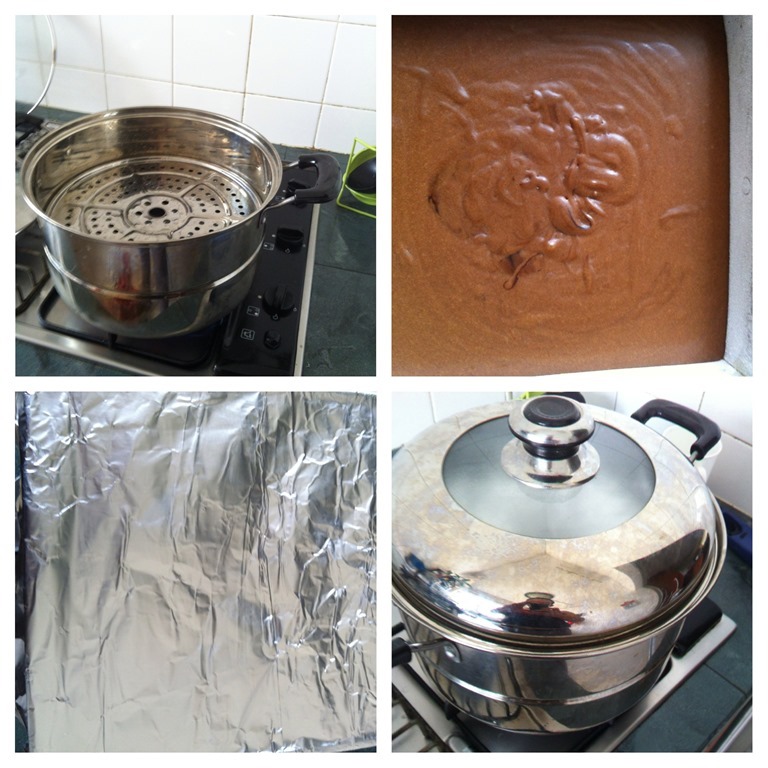 When the water boiled, put in the cake tin and steaming over medium to high heat for 3-4 hours. Note that how long it takes to cook will depend on lots of factors including the size of baking tins you used (a big baking tin with a shallower batter will be faster to get cooked than a smaller tin), the environment (in an enclosed environment it will be easier to get cooked than in a well ventilated area). As a guideline, after 2 hours of steaming, you can slightly lift up the aluminum foil and see if the batter was set. Set means when you push, the batter wouldn’t move. Usually, the middle part is the part that takes longer to cook. Whatever you do for this process, you have to be careful to minimize the heat loss, otherwise it will take time to get enough heat for the cake to rise again and some may not be able to rise as the cake structure had been destroyed. If there is not enough water, just boil some hot water and pour inside the steamer carefully. You may need to replenish the water 2-3 times. The cake is cooked when it looks like the first picture. To counter ensure that it is cooked, use some stick to pierce down the batter and see if anything sticky in your stick. If none, the cake is ready. Let it rest for say 30 minutes and transfer to your cake rake if you want. Note that when it is hot, the cake structure can be very fragile, cooling will gel backed the structure . So, any handling have to be done gently. The 1st picture showed the cake just come out from the steamer. After about 1.5 hour of resting, I dusted with some Ovaltine and Milo (optional) powder. You can see from the cross section of the cake that it is very moist and dense. Cutting the cakes into the desired size, serve with or without sauce. Picture one is serving without any sauce. 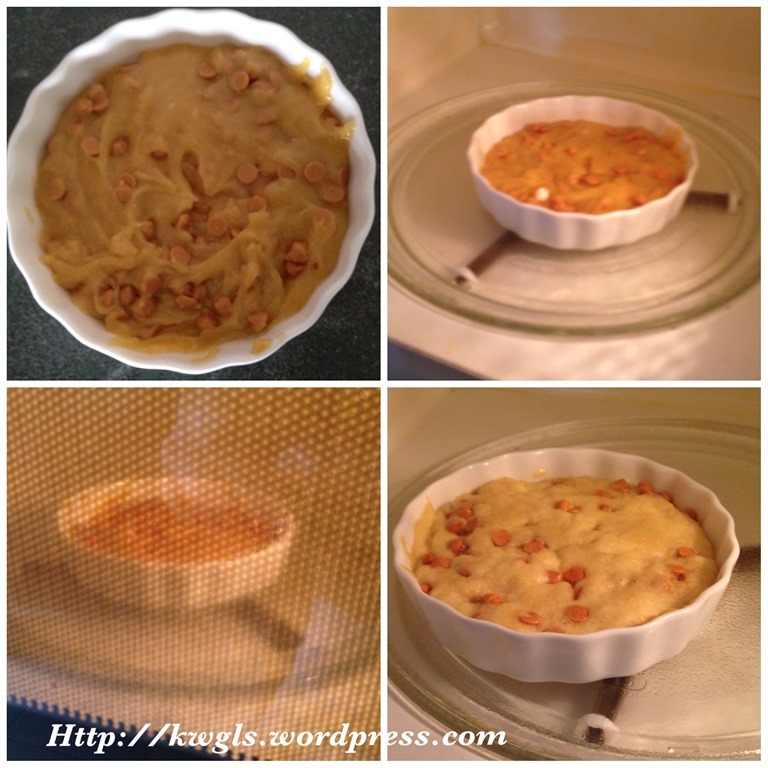 Picture two to four is serving with evaporated milk and some dusted with Ovaltine and Milo powder. Fresh milk can also be used. In picture four, I have decided to turn it into some form of wet dessert soaking in milk. As the texture is very soft, you can actually turn it into any shape with it. Trust me, it wouldn’t compromise the original taste. The original taste is very strong and this will smoothen out the strong cocoa and chocolate malt flavor. This is a super rich and dense cake. 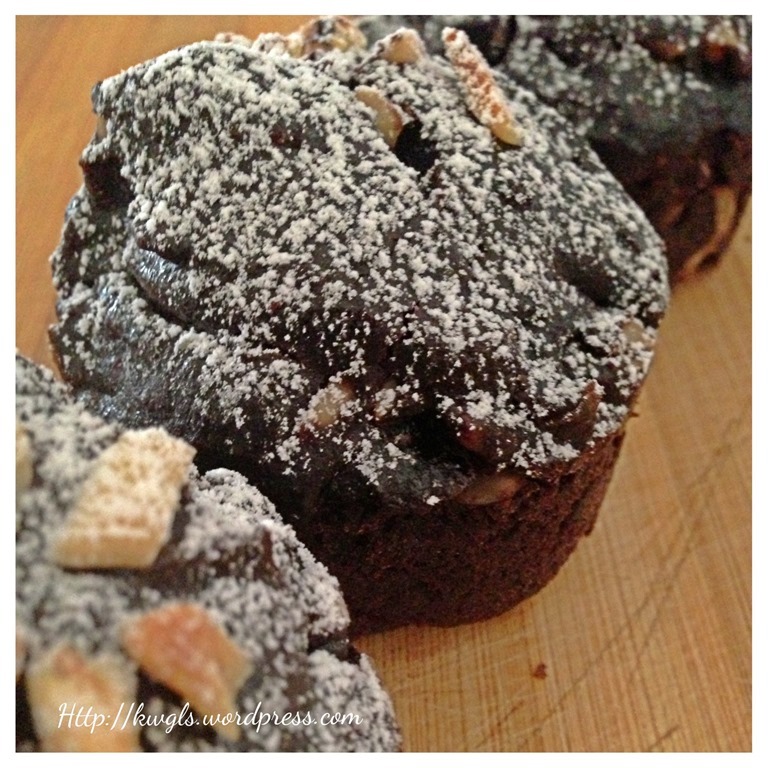 You can treat it as another form of chocolate mud cake or American midnight fudge cake. Taking a bite is resembling like having a scope of butter, coconut jam, chocolate malt, condense milk all at once which is extremely smooth and with the nice aromatic smell of breakfast beverages. 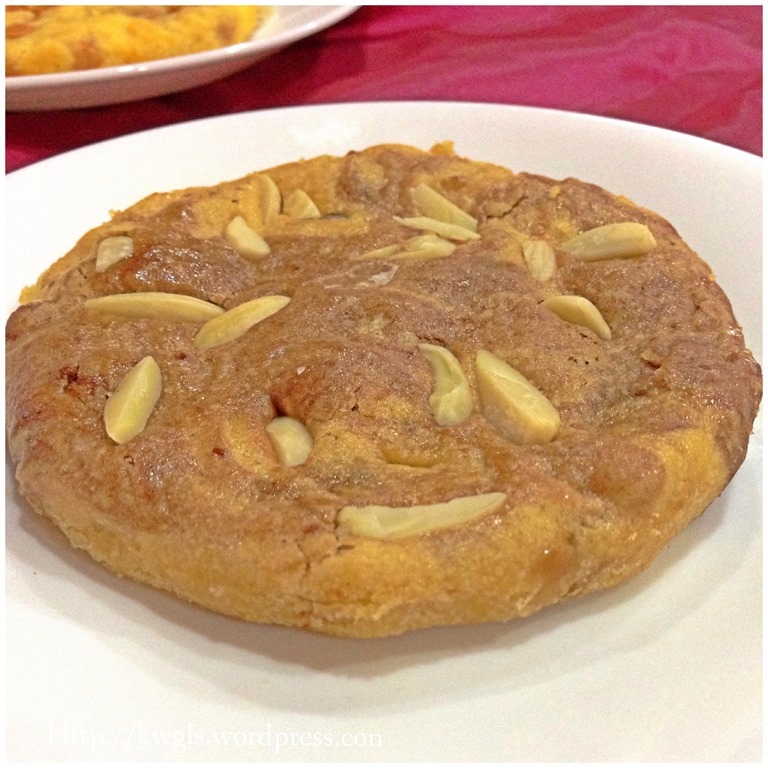 The origin of this cake is still unknown but it is unique that all the main ingredients are related to the breakfast items such as Milo, Horlicks, condensed milks and coconut jams used for toast. Could this be influenced by the British during the British colonization of Sarawak before 1945’s? Only coconut jam and black palm sugar is quite local and all other ingredients are most imported or originated from European countries. 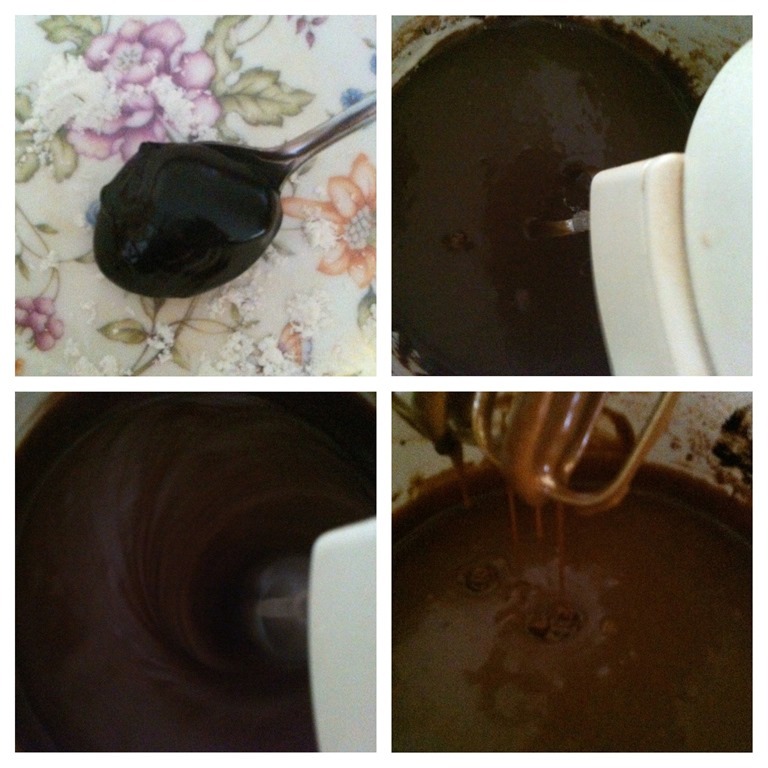 The Western version of fudge cake or midnight cake requires chocolates, using the creaming method and utilizing the oven for baking. As oven is a luxury in traditional Sarawak, steaming method was used instead. Imported chocolate will cost a bomb and therefore these were substituted by breakfast beverages. Does it sound logical? Otherwise, how can an isolated island with so much diverse culture can come out with such a rich and nice cake like the desserts in Western countries? Let me know your opinion. 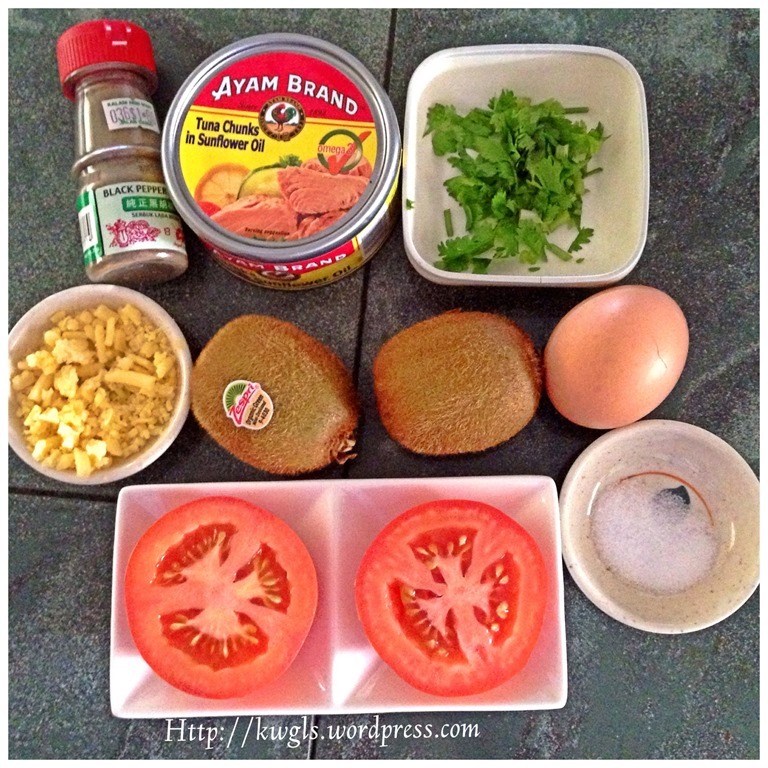 Like Sarawak Laksa paste, too secretive a recipe and too many versions of a recipe will equivalent to no recipe. 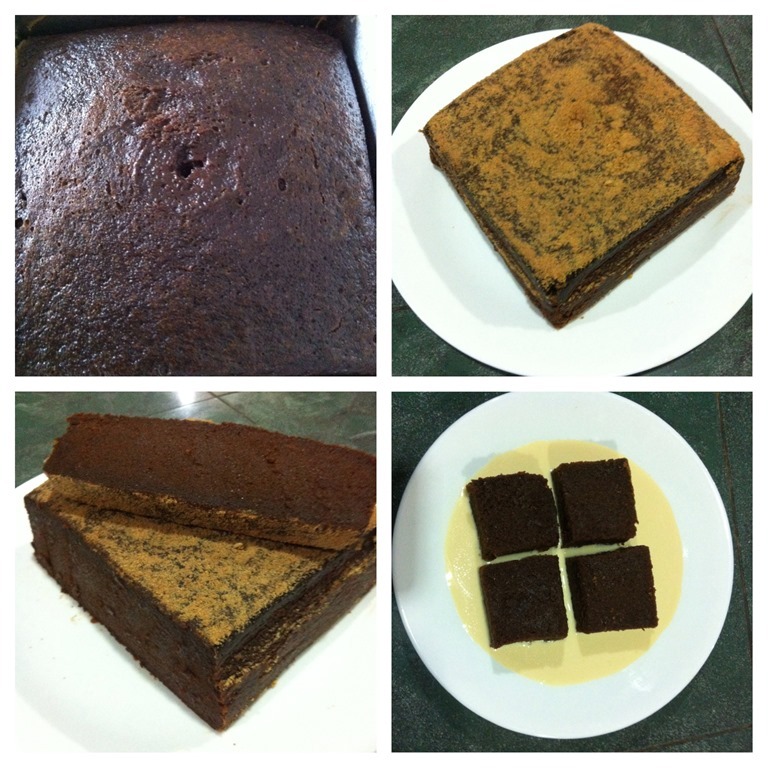 I have simplified the ratio and the preparation method with no compromise in the texture and taste of my cakes. Today is Saturday and I have done my marketing earlier in the morning when my kids are sleeping and the crowds in the supermarket were lesser. 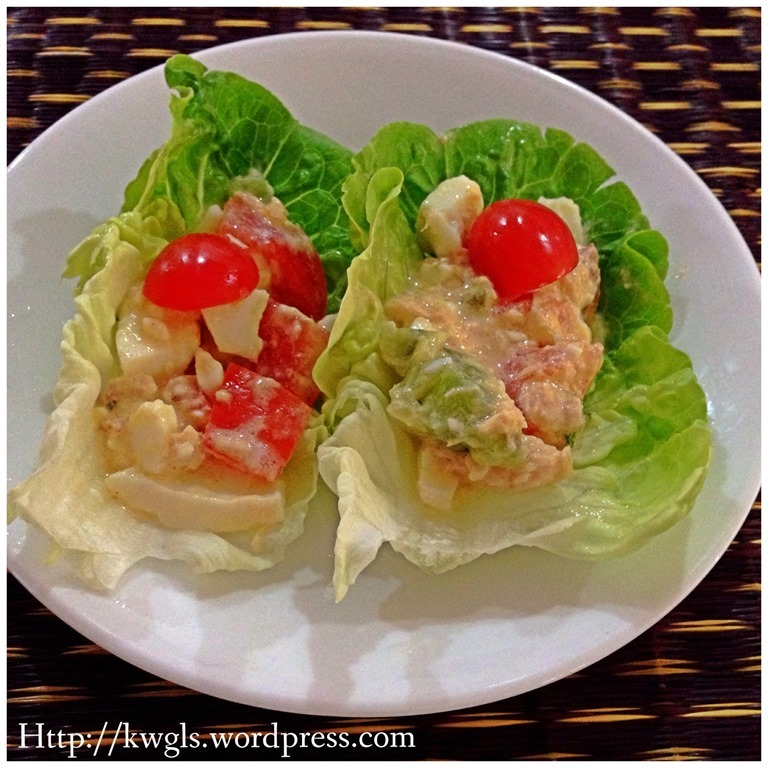 I have just completed my marketing, cleaned my seafood and put back to the fridge and is time to issue my post today. 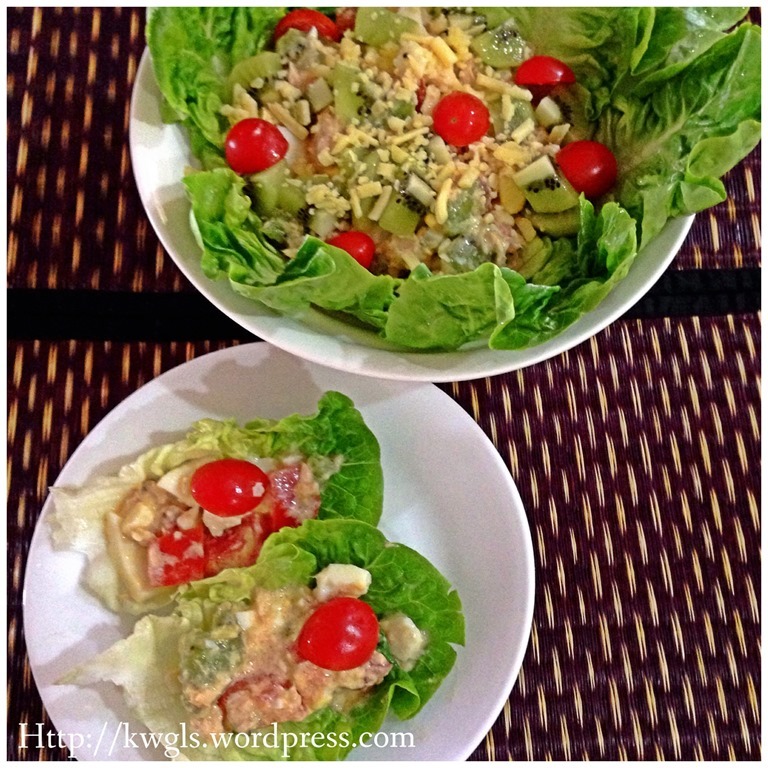 Putting that aside, today I am going to share a very simple salad recipe that I have prepared yesterday. 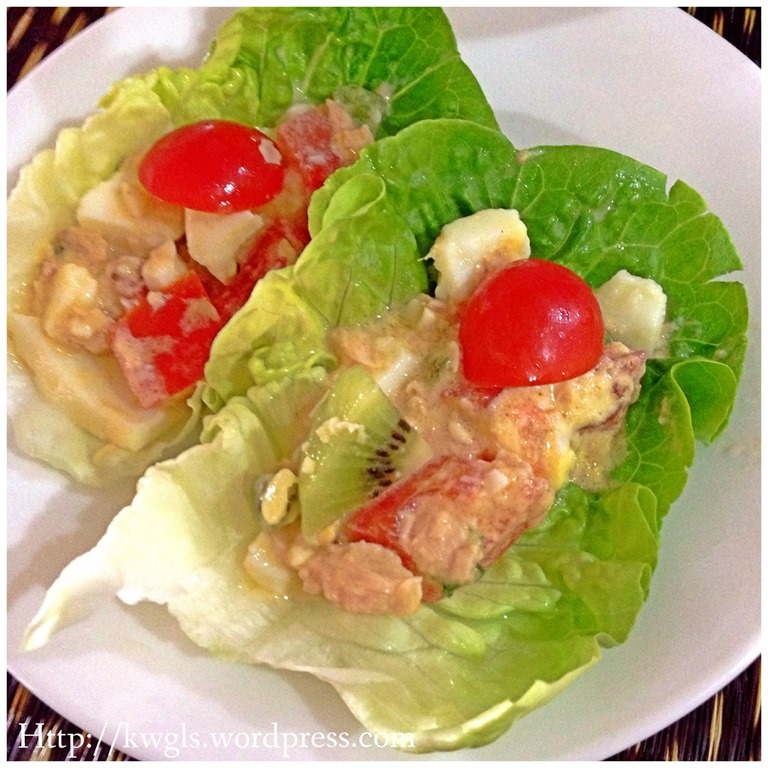 It should be one of the healthiest cuisines that I have blogged about as the fats involved is minimal and the ingredients are packed with proteins, vitamins and minerals. 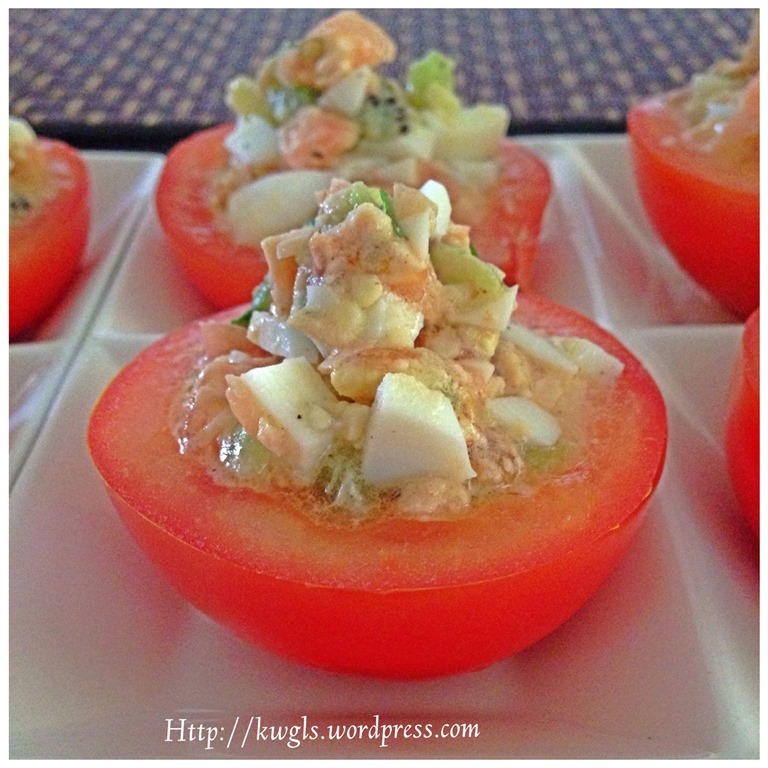 This is my own creation and I do not have recipe for you to refer. 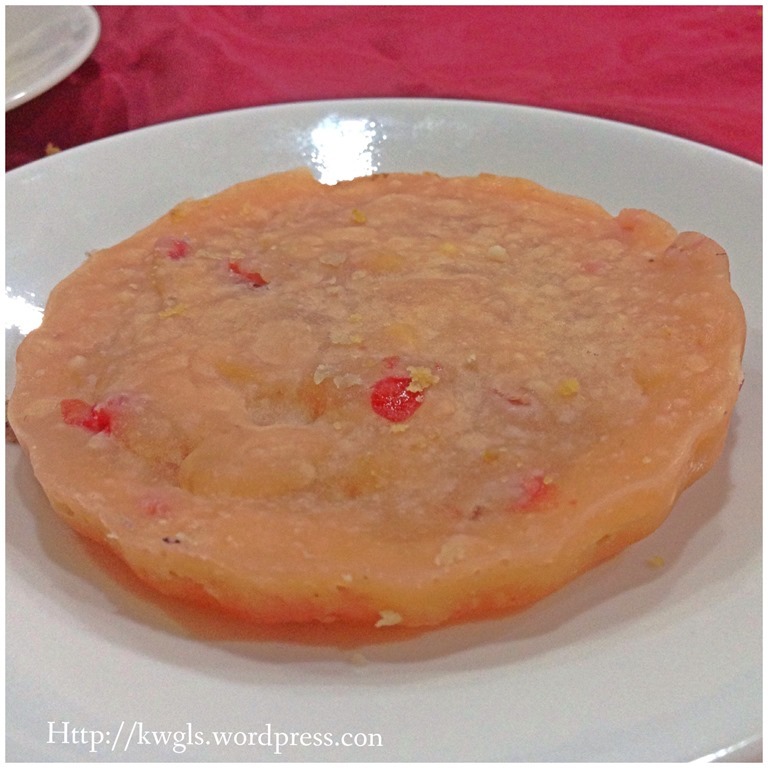 It is really a refreshing alternative after a few post of meat dishes such as Dongpo Meat and Chinese Barbecue Pork. 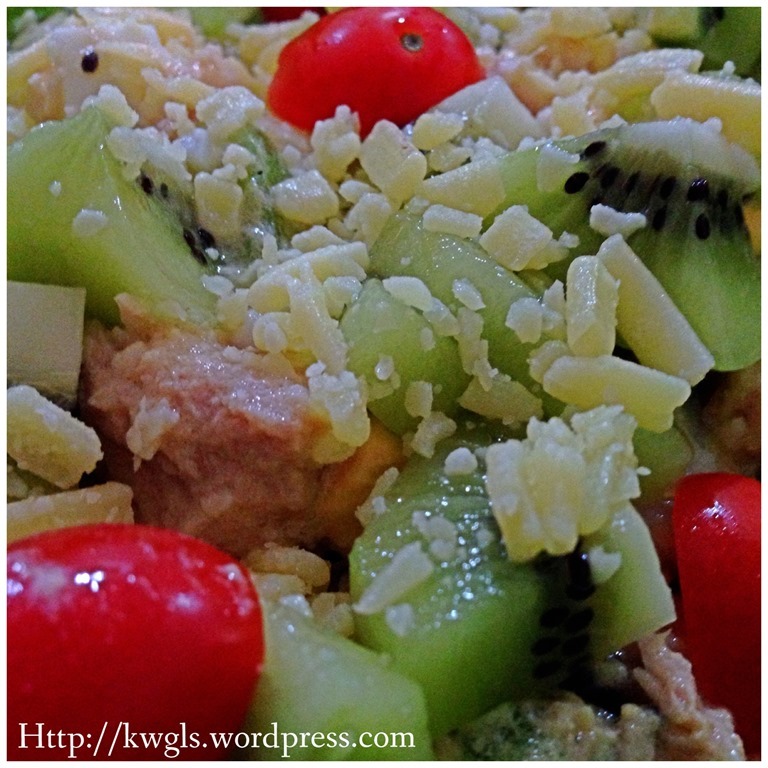 I have named this salad as “TUNA KIWI SALAD” though the major ingredients were tomatoes. 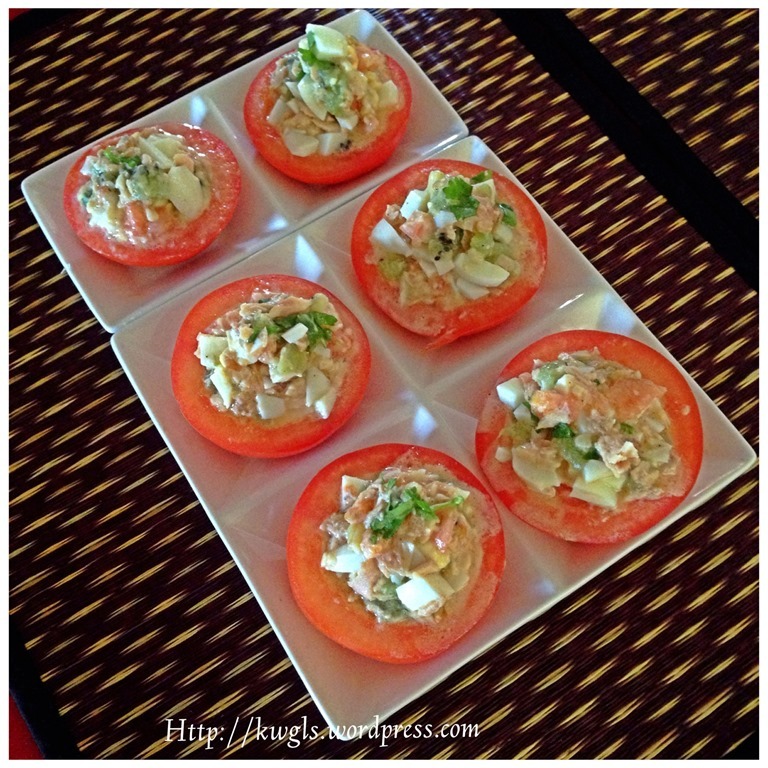 I will also share a number of presentations that you can consider how to serve this delicious salad. As it is a salad, therefore, I am rather reluctant to give an exact quantity. The quantity and types of ingredients are for reference only. 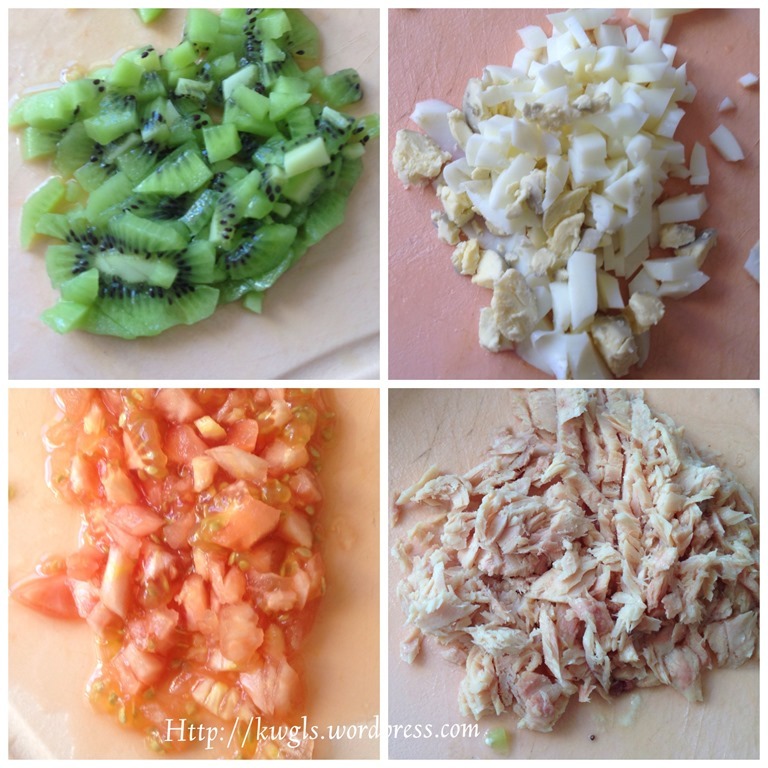 2 kiwi fruits de-skinned and cut into small cubes. 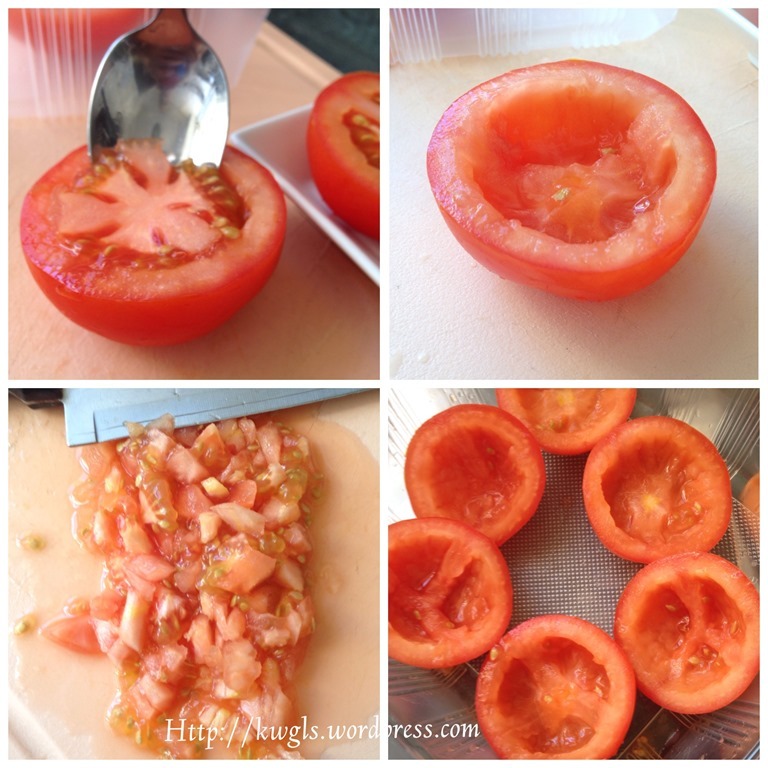 Cut the tomatoes into half. Use a spoon to take away the centre. Chop the centre into small pieces. You can either keep the seeds or throw away the seeds depending on how moist is your overall salad. However, it is advisable to throw away the seeds and juices but keep the centre. This illustration included the seeds and hence the salad was a bit moist. 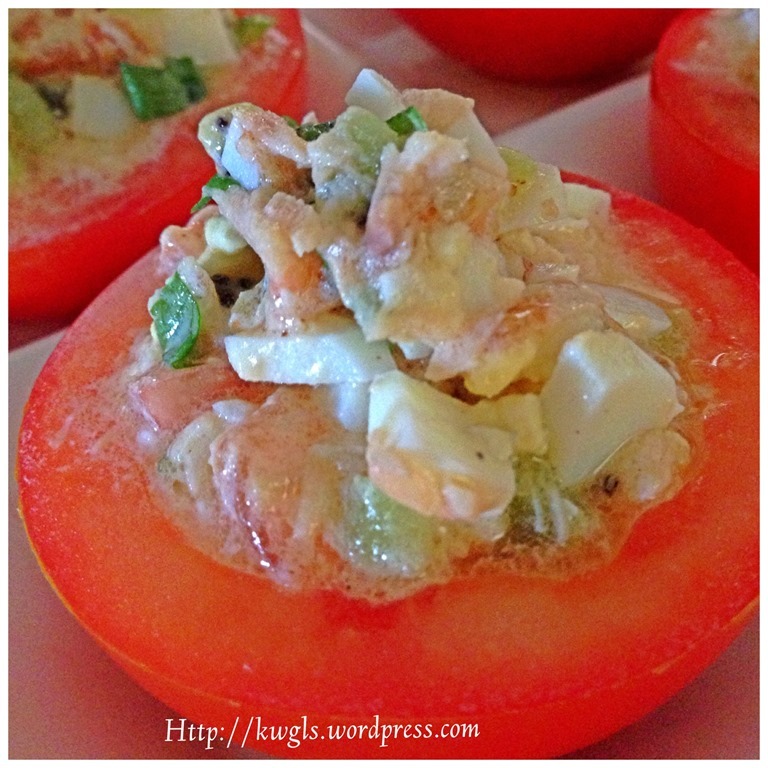 Cut the kiwi, boiled eggs, tomatoes and tuna into small pieces or chunks. Put all in a big mixing bowl. Add either chopped coriander leaves or dry Italian herbs, black pepper, pinches of salt and shredded cheddar cheeses. Stir until well mixed. Note: You have to be careful about the addition of pinches of salt. If your tuna is soaked in brine when you purchased it, there is no need to add salt but you may need to add in olive oil. If your tuna is soaked in oil when you purchased it, there is no need to add olive oil but you have to add it pinches of salt. If you prefer, you can add in some lemon juices. 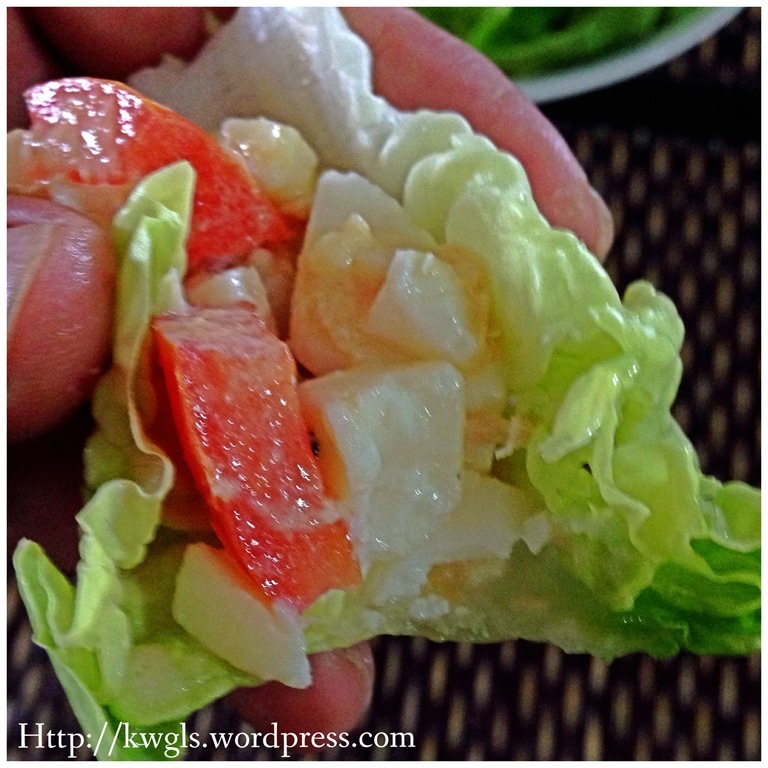 Scoop out the salad in the tomato cups or fresh lettuce leaves. Dust with additional cheeses or black pepper if desired. 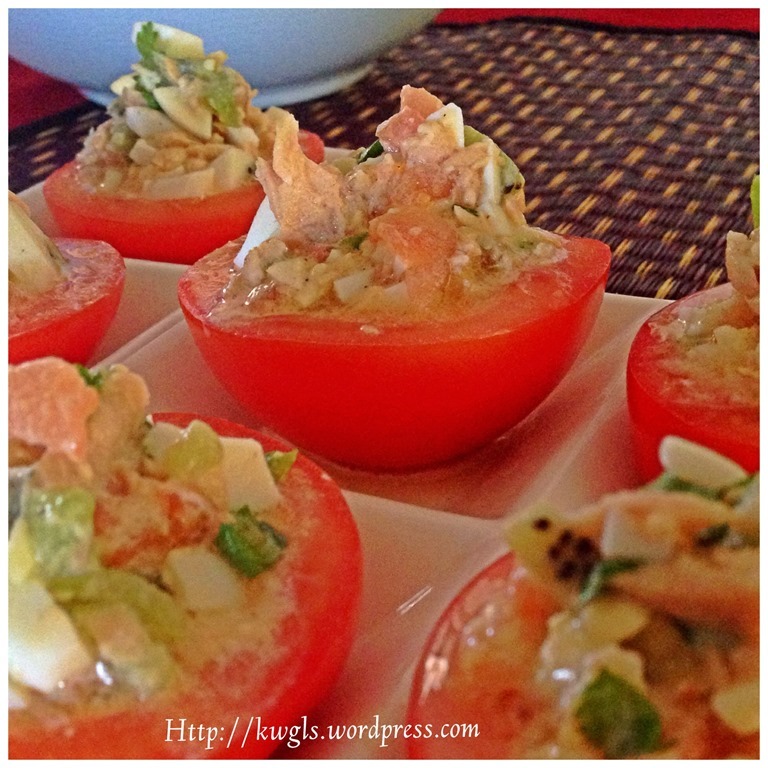 Personally, I liked this tuna salad very much. 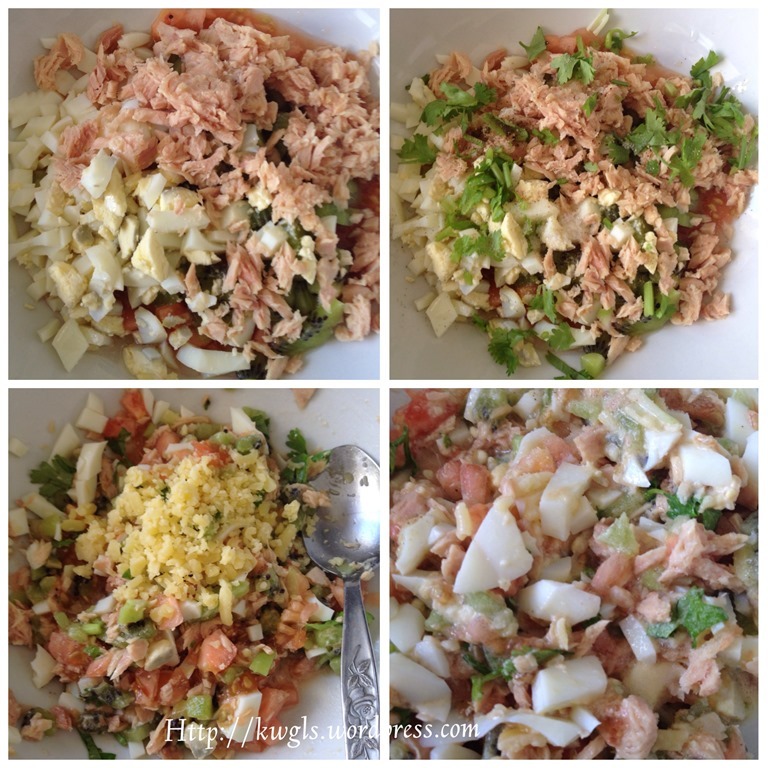 It is very healthy and easy to prepare. 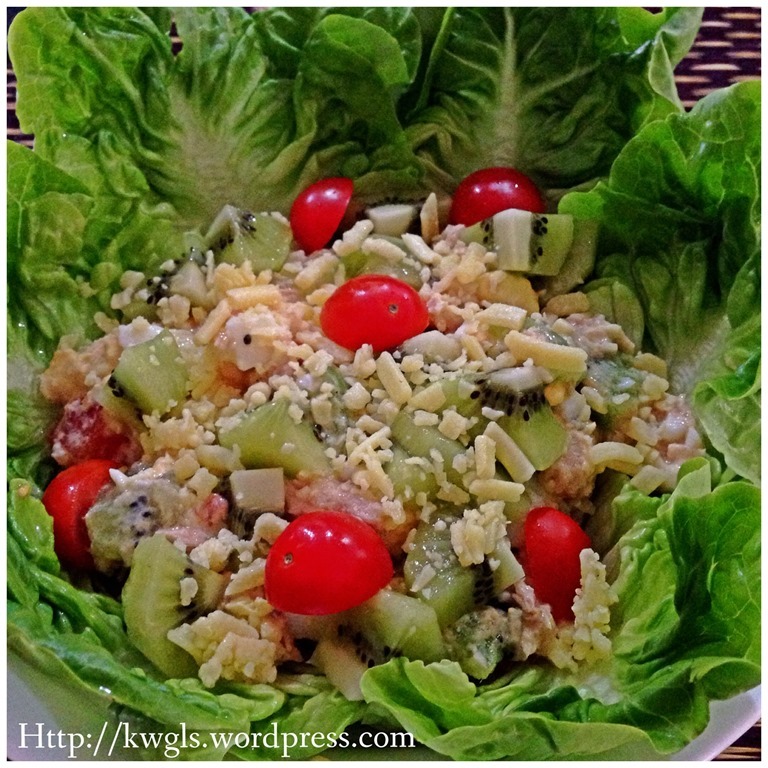 Try and see if you like the salad or not. 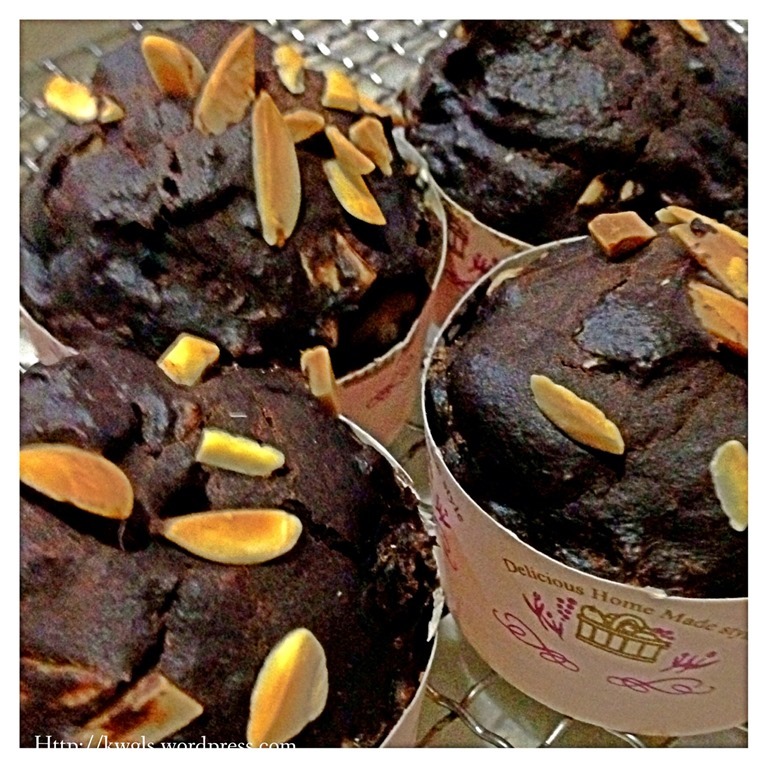 How About An Eggless, Butter Less, Milk Less Chocolate Almond Cup Cakes? 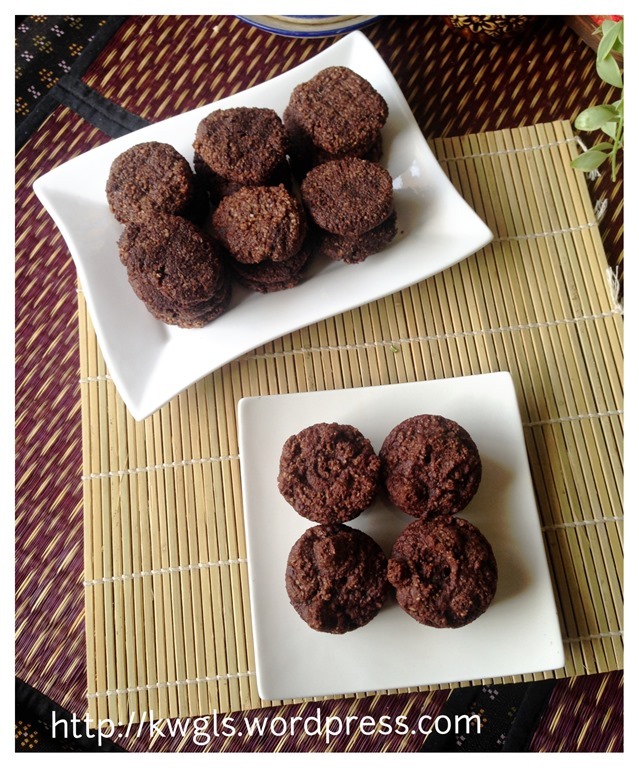 I will include in this post another recipe that I have developed this morning, it is gluten free, dairy free, egg less and fatless. 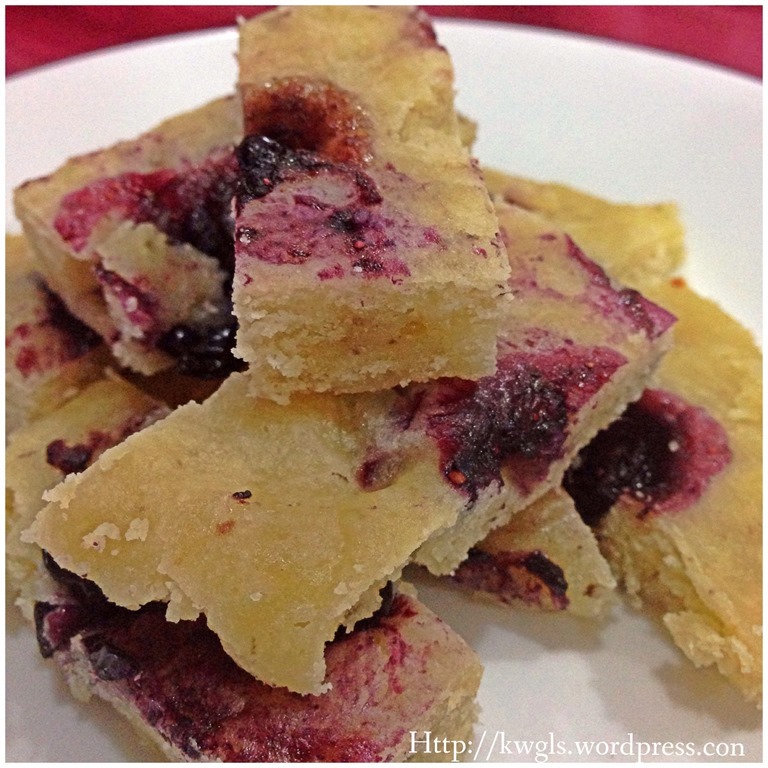 It is a rather healthy moist and aromatic snack. 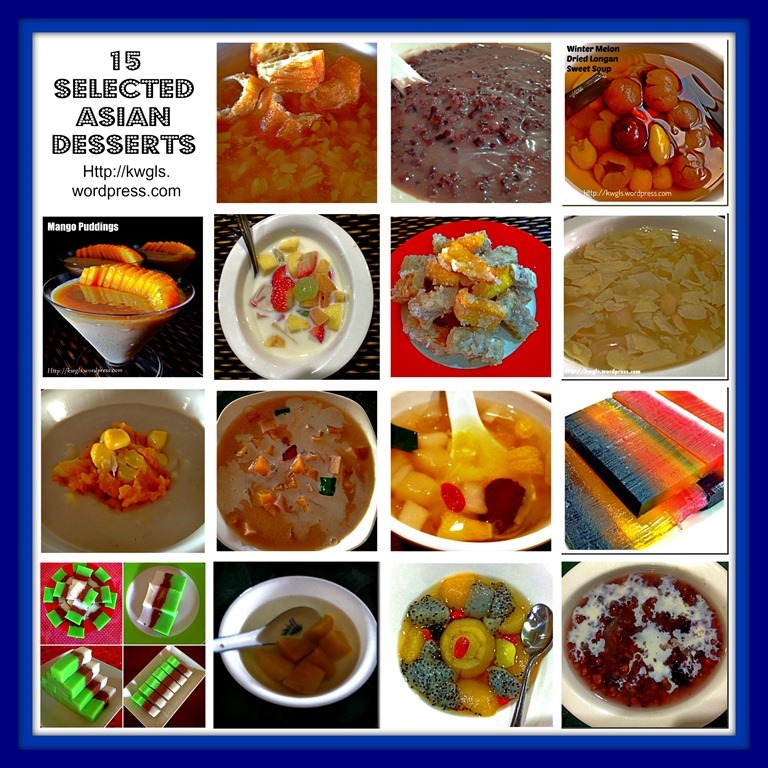 I hope this post will benefit those who are on a certain diet. It is the same recipe for both cookies and cupcakes. 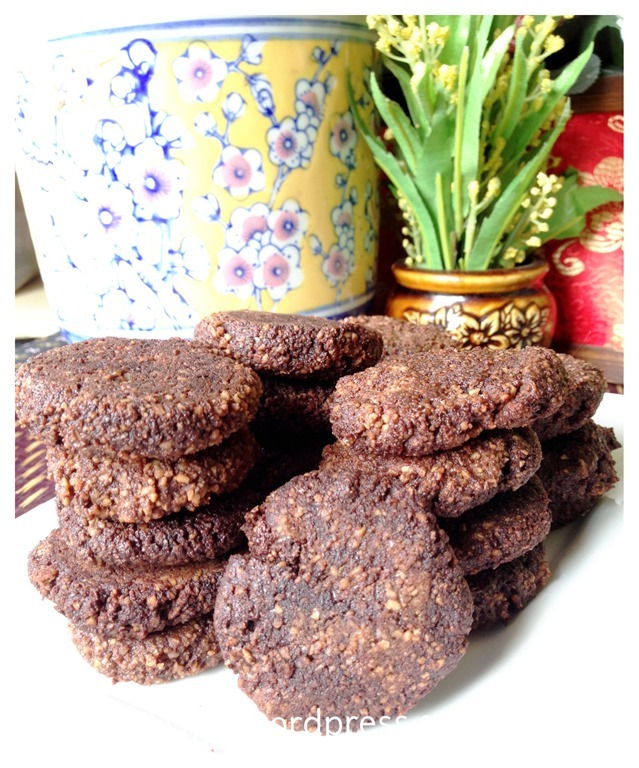 For cookies just make it in smaller size and bake slightly longer.. It can be crispy or chewy. It will not be as crispy as those using flour. Taste wise is satisfactory. 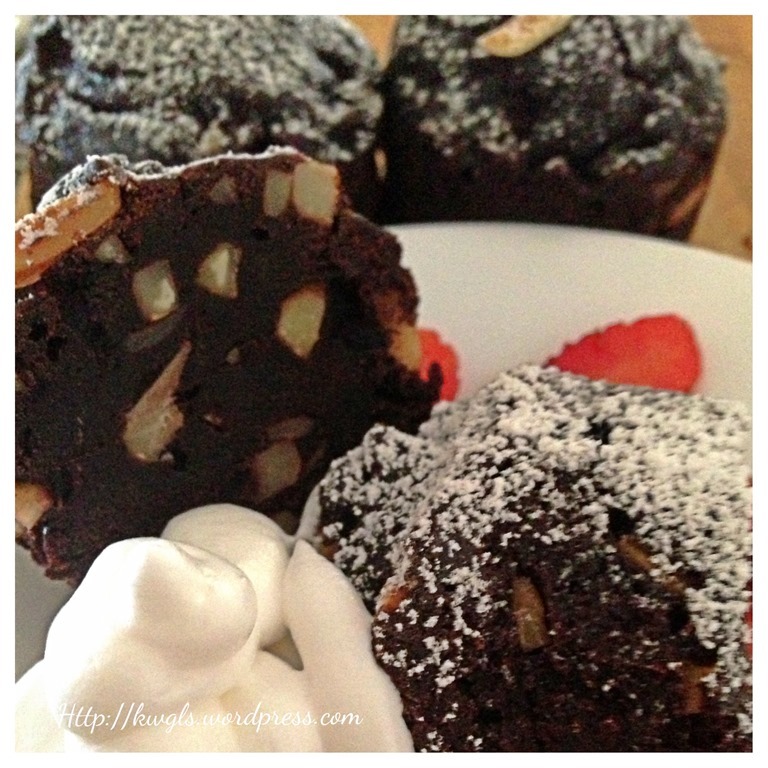 You can imagine taking some almond meal, add some cocoa powder, water and sugar.. It is definitely acceptable to most. 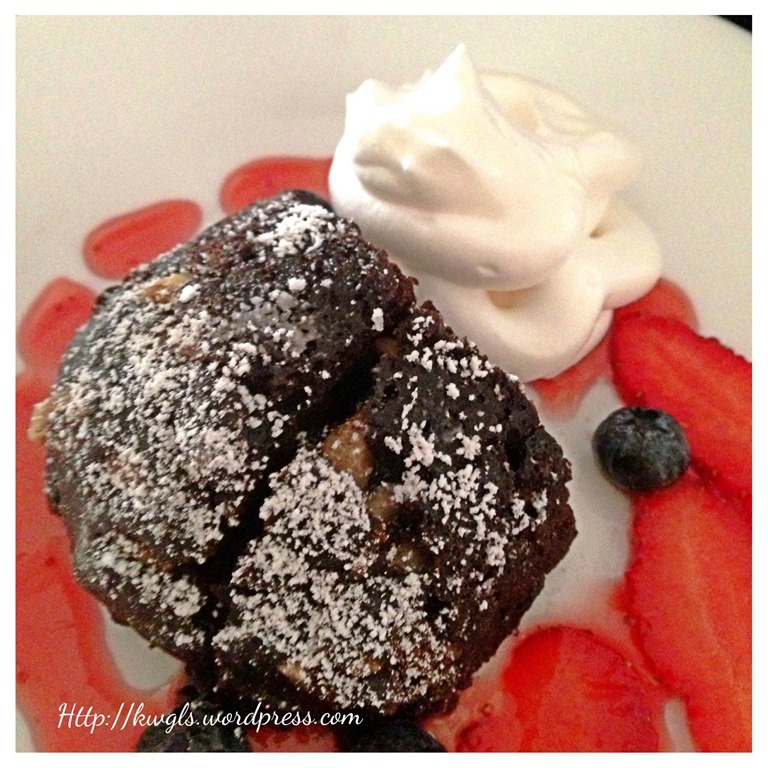 Please scroll down for the second recipe. 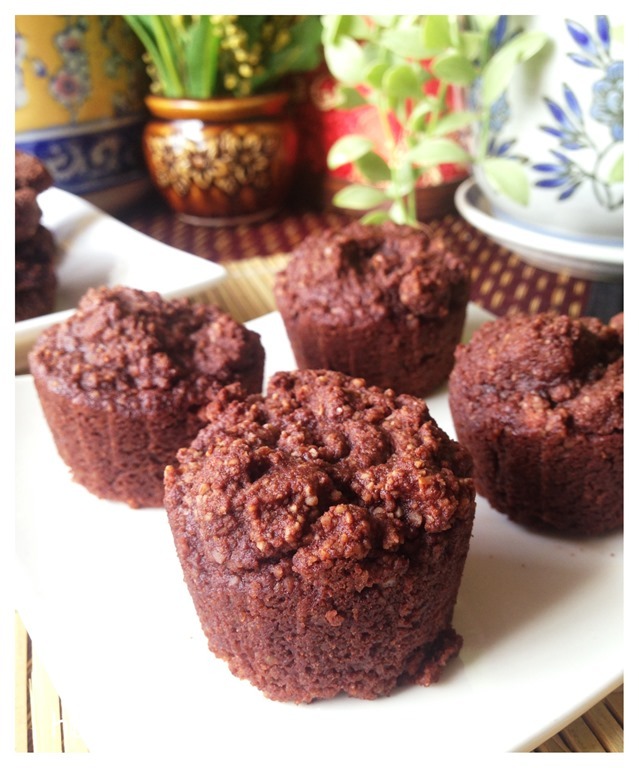 This is an eggless, butter less and milk less cup cake that I have adapted from a 2003 recipe. I have printed out this recipe as early as year 2005 when I just started to have interest in doing some baking. 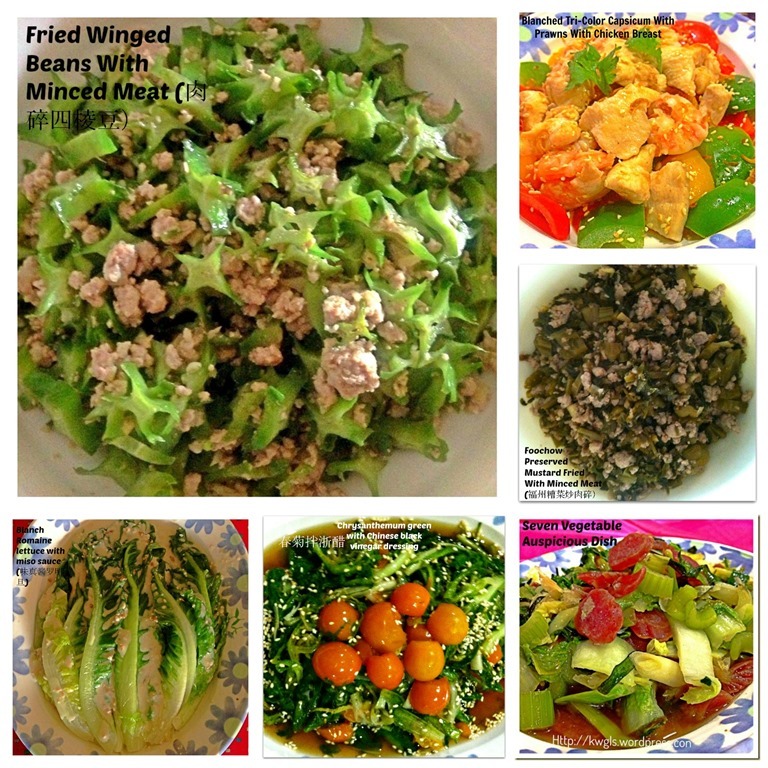 Then, I have been cracking my head to look for recipes that were suitable for niche markets like health conscious people or people that are less fortunate like diabetes . While flipping my recipe file yesterday, I saw this piece of printed paper and I thought I might wanted to give it a try. 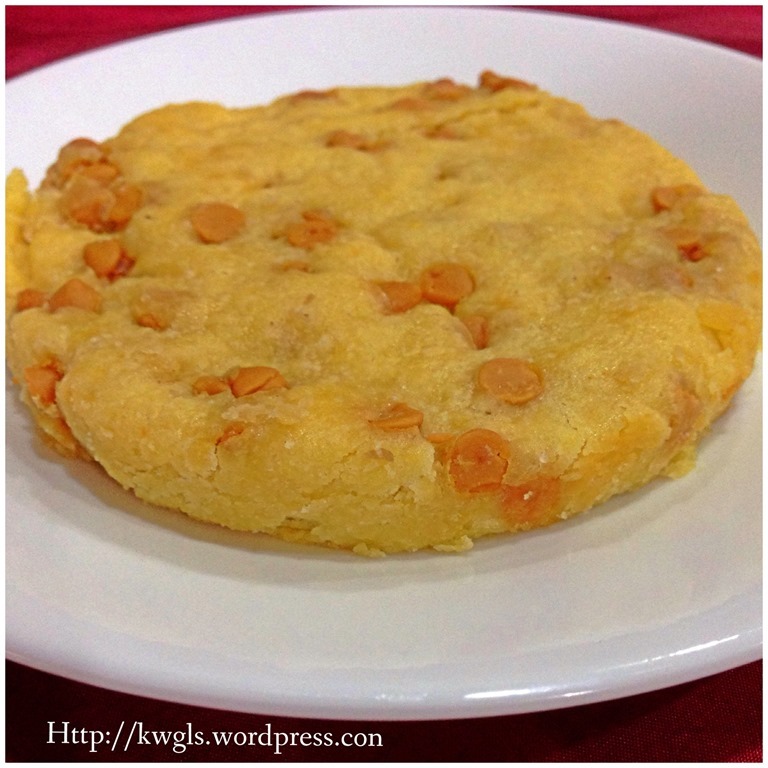 Since it is an eggless, butter less and milk less, what should be the structure liked. If you looked at the recipe in detail in later part of the post, you will note that there are some shortening and water. 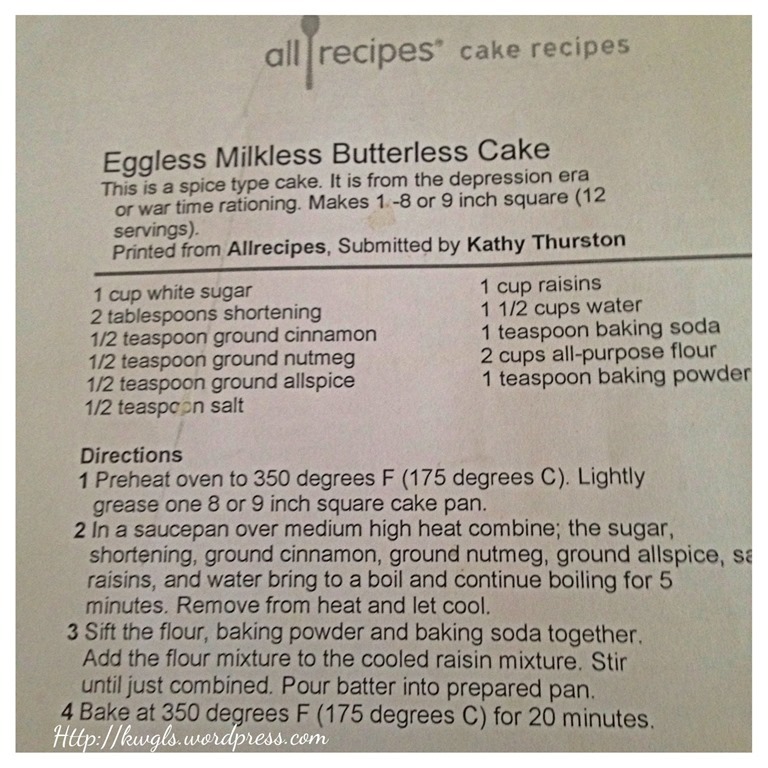 Butter less can be substituted with cooking oil or vegetable shortening (as in this recipe) and milk less can be substituted with any liquids (be it eggs or water). 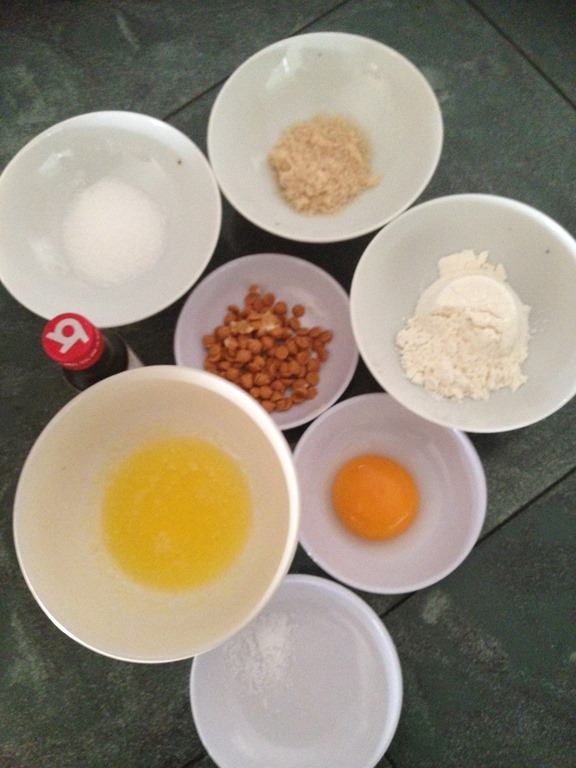 Therefore, the crucial element that determine the outcome of the cup cake will be eggs. 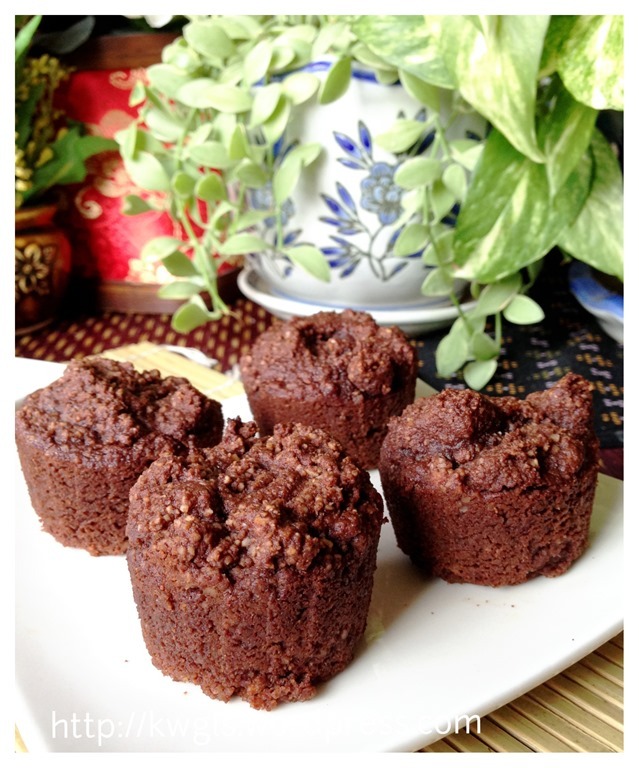 Eggs have the role of supporting the structure of the cup cake or in general any baked products. They are binder which help to hold the ingredients together. In addition, it contributed to the liquid component in a cake recipe. 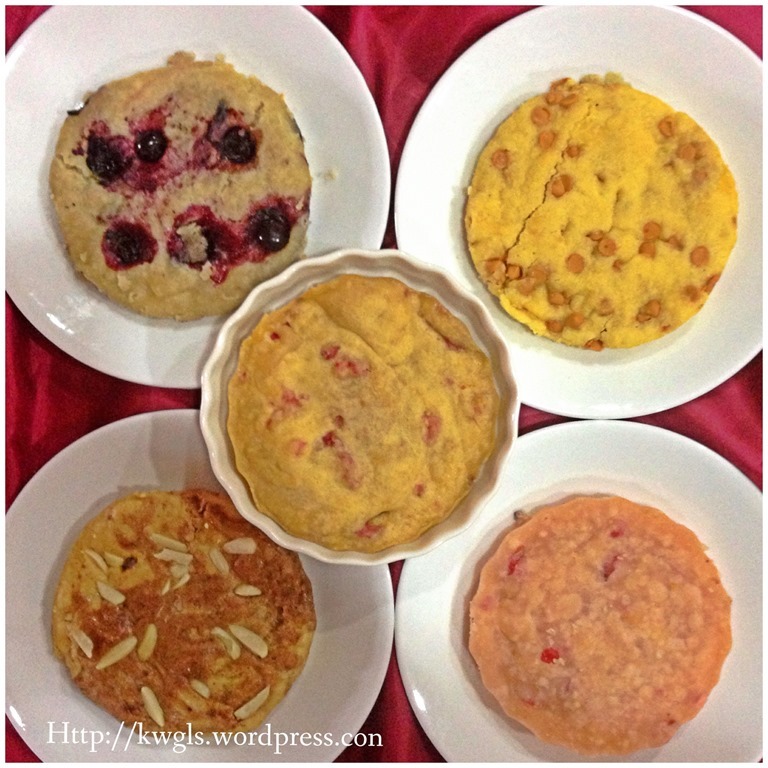 Therefore, it is expected that without eggs, the cake will be dense and the rising of the cake will depend entirely with the leavening agents such as baking powder and baking soda. I am worry about whether the dense cake will be dry and difficult to swallow. The conclusion is not, as the recipe have minimal vegetable shortenings and some liquids which is adequate to make the cake moist. 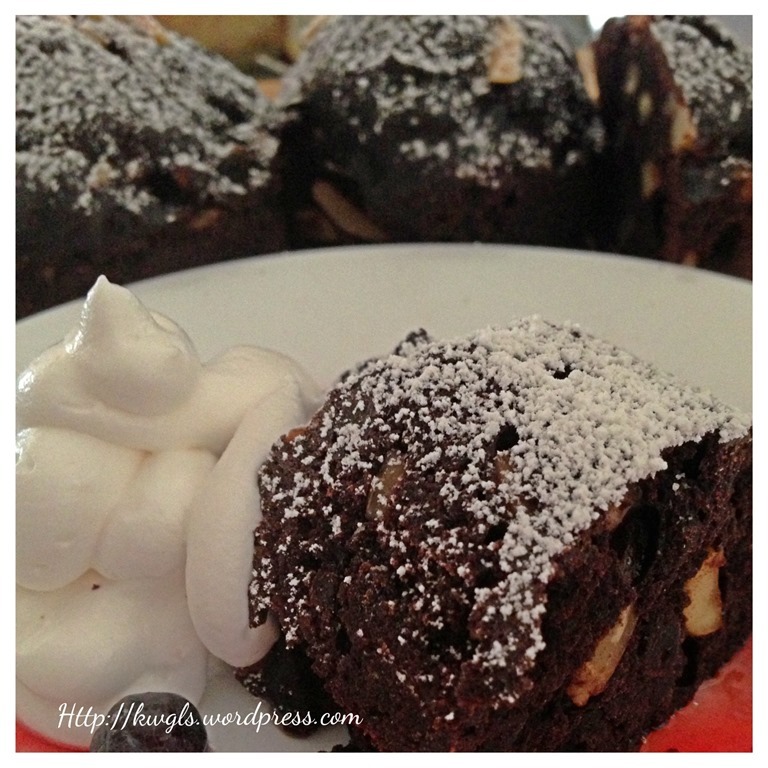 In this recipe, I have increased the amount of water, addition of cocoa powder and some almonds chunks. 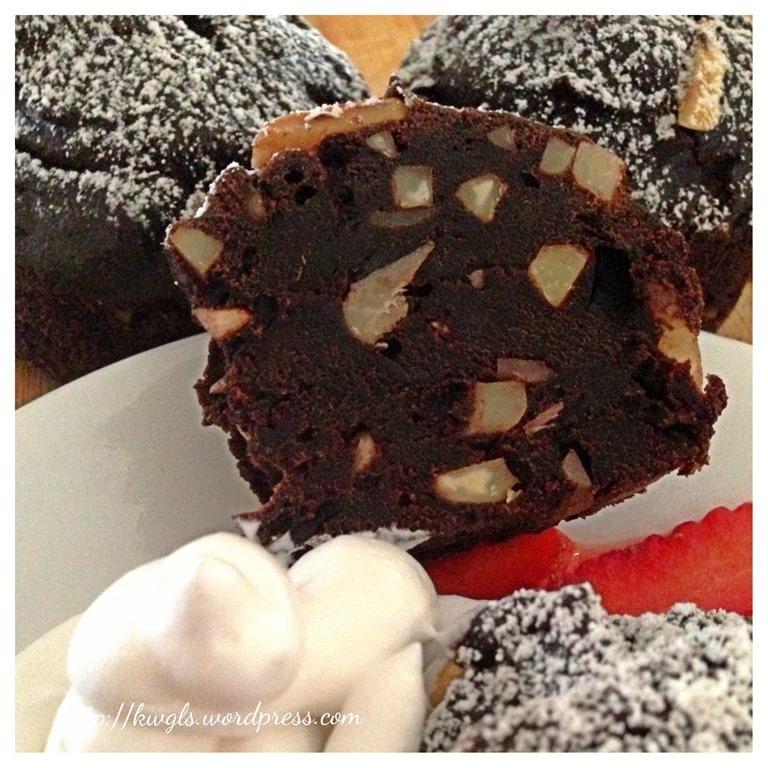 The final baked products were well beyond my expectations and I concurred it was some form of good snacks. 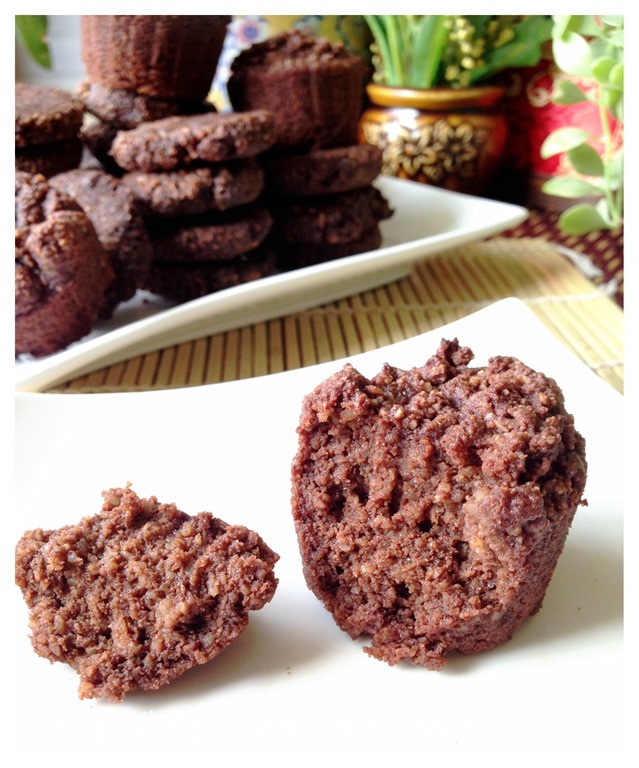 As I was experimenting with this recipe, I have reduced the volumes and managed to make 4 small cup cakes. 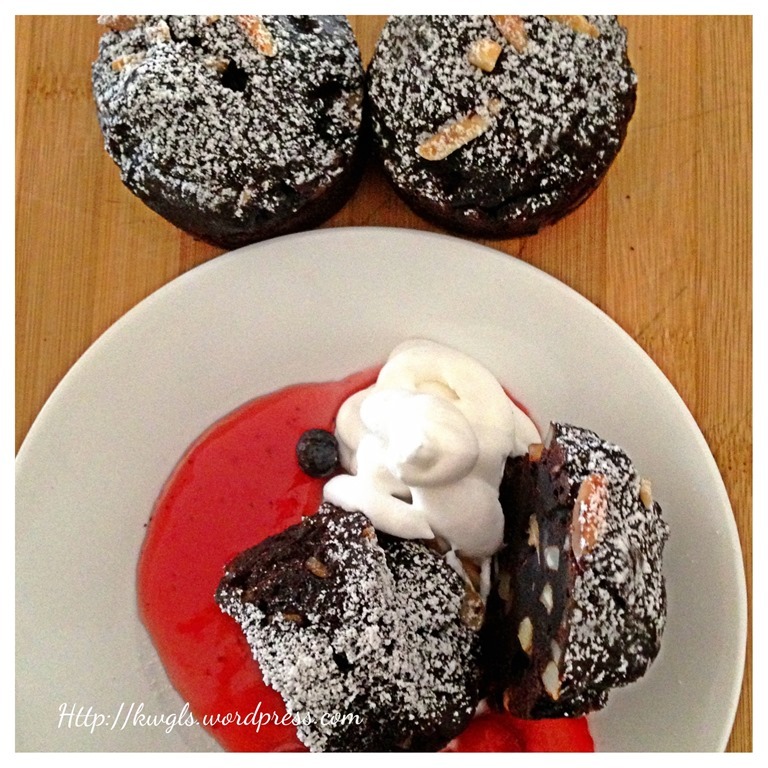 As with any other cakes, serving with additional sauces and whipped cream will heighten the palate to another level. 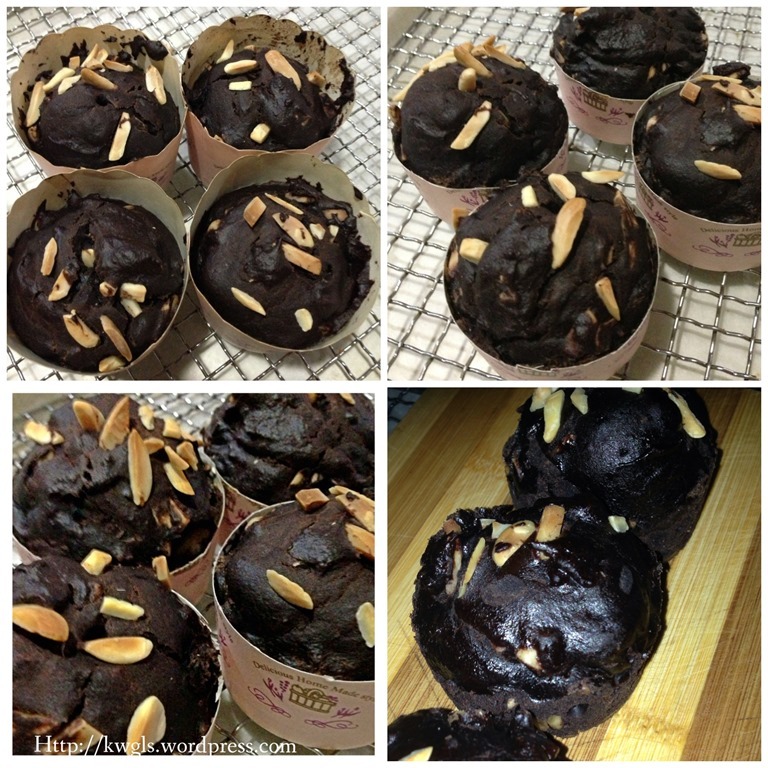 Preheat the oven to 180 degree Celsius and get ready some cup cake moulds. In a sauce pan under medium heat, bring the vegetable shortenings, water and sugar to boil and continue boiling for about 2 minutes. 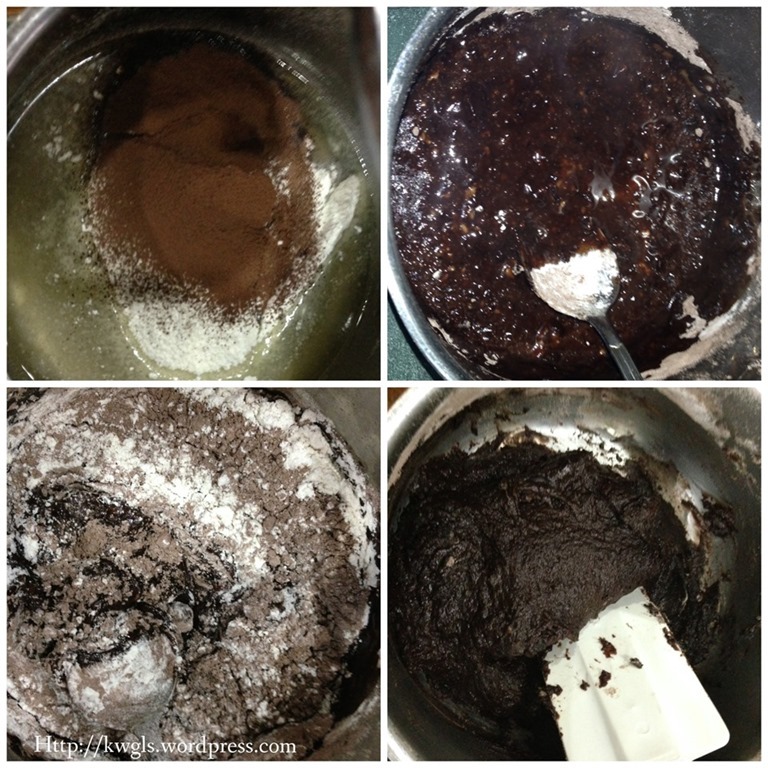 Sift the flour, cocoa powder, baking powder and baking soda together into the liquid. 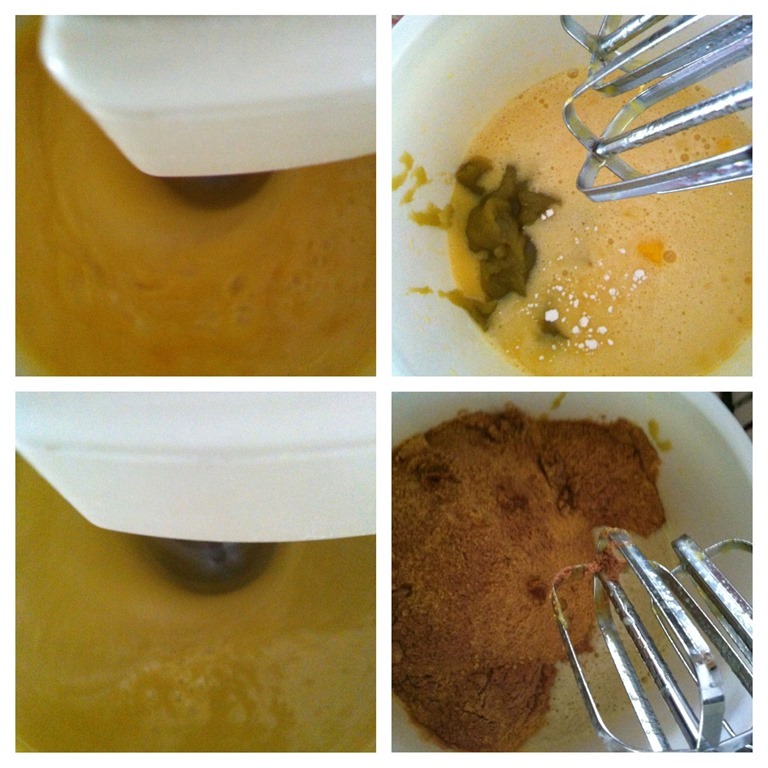 Use a spatula to stir the batter until it is well mixed. Stir in the almond chunks and ensure it is well mixed. 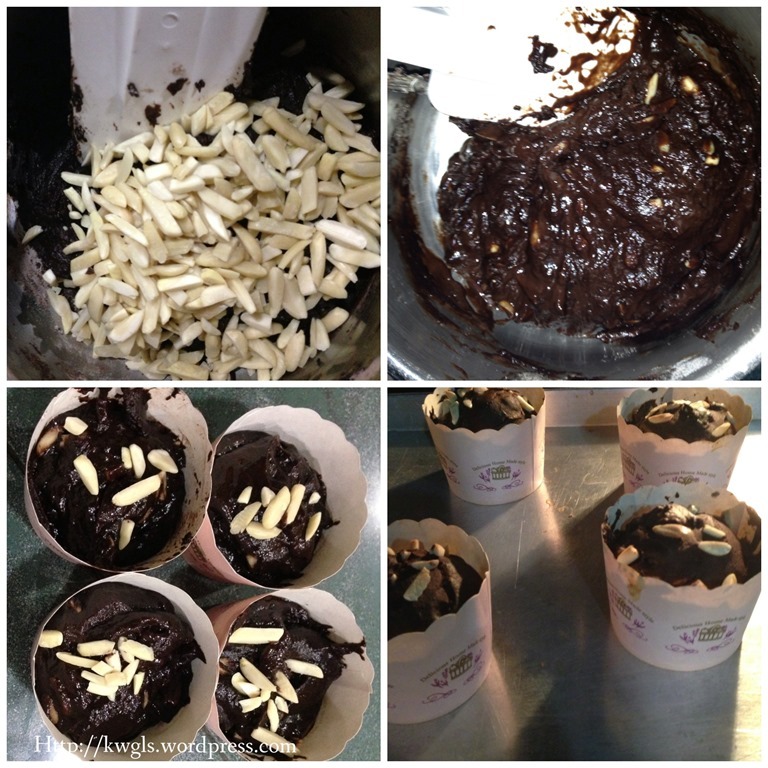 Scoop into the paper cups for cup cakes and baked in the oven for about 20 minutes or when the skewer inserted come out clean. This is a rather unusual cake. So who should prepare this? In fact this cake is very suitable for people who are vegetarian in accordance with Buddhist principles. In my circle of friends, I have a few friends who are vegetarians. However, though all are vegetarians, there are certain ingredients that fell into “grey area” and subject to arguments. Another two special ingredients are two diary products, milks and butters. Some vegetarian will not touch any food “produced” by an animals, therefore milks and butters were excluded in their diets. Whereas some choose to believe that as there is no need to kill a cow to get milks and butters, therefore, these can be included in the vegetarian diets. These belies have an impact in pastry terms. 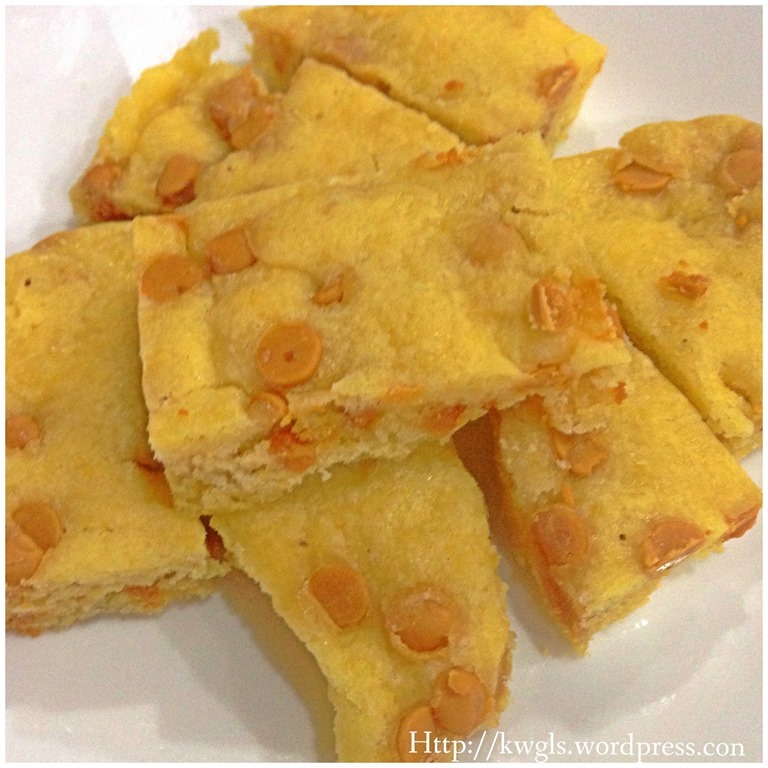 Every year, when I baked my pineapple tarts for my relatives and friends, I will have to bake two types, the normal with milk, eggs and butter and another version, which is rather hard to prepare that is eggless, milk less and butter less! Of course the onus will lie on me to find relevant substitute for the ingredients. Hope you like this rather strange post today. But, I have to admit that looking at the picture, you may not be convinced until you take a bite of it. Have a nice day and cheers. 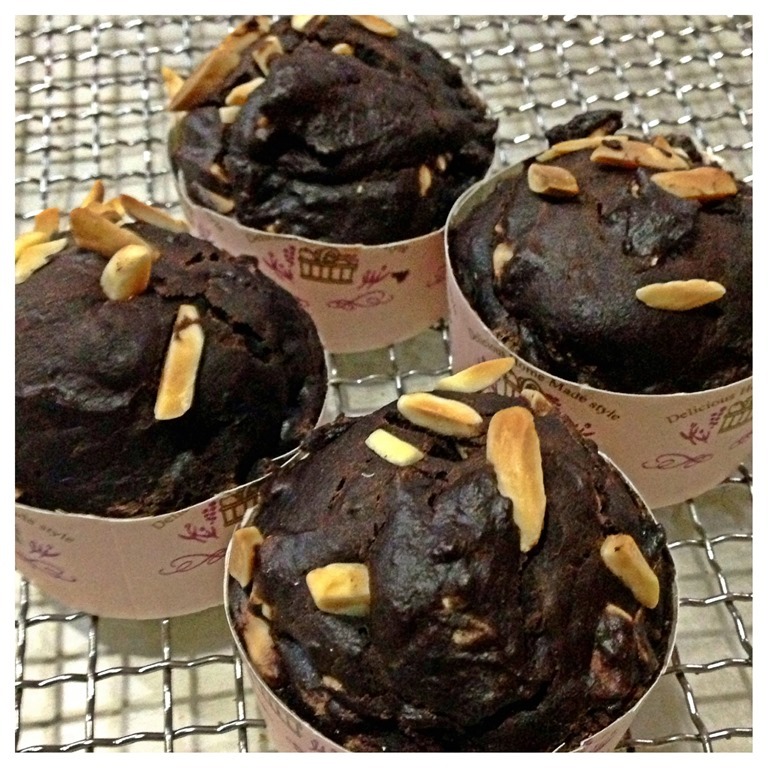 Transfer to cup cakes cup . 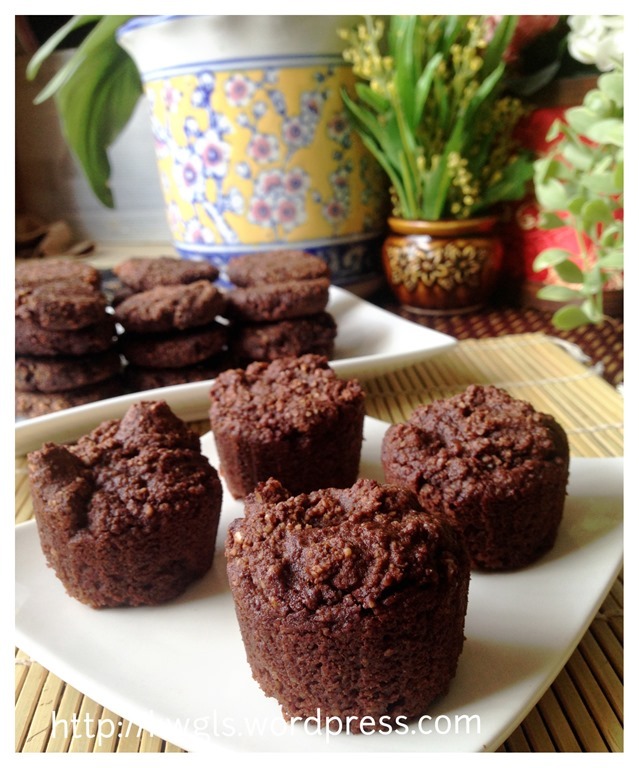 For cookies, add about 1/8 teaspoon of baking powder to the batter, bake at 160 degree Celsius for about 20 minutes. Let it sit in the tray for 5 minutes before transfer to the rack for cooling. If you want it to be crispier, can extend baking time by another 5-10 minutes.